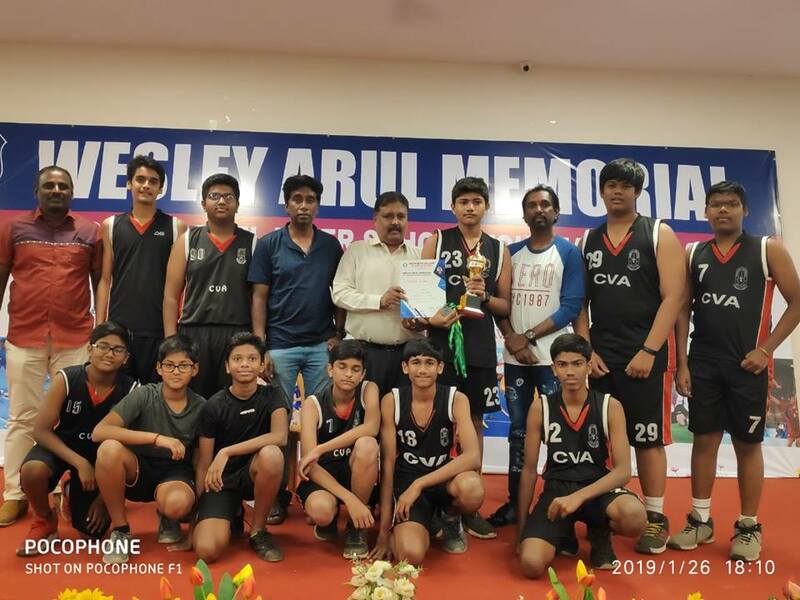 Nazareth College of Arts and Science conducted State level Inter school Basket ball Tournament in which our school Boys team won the III place. 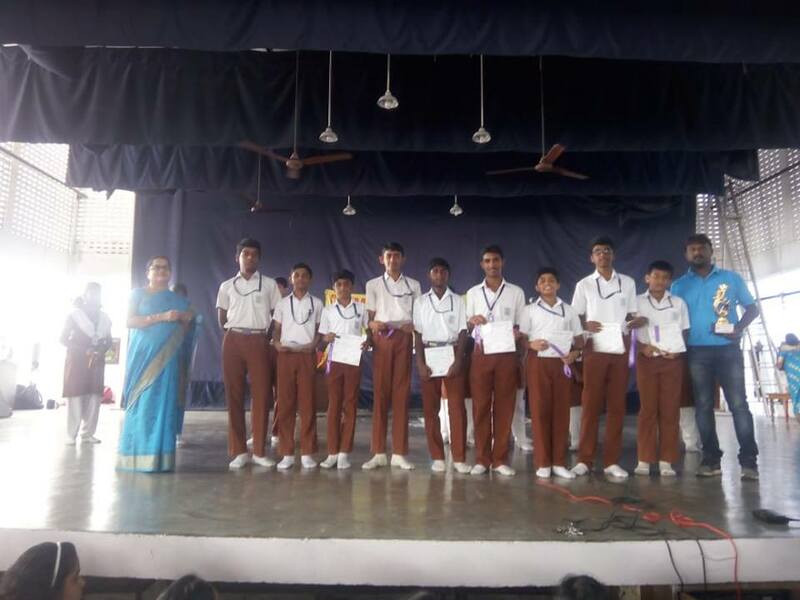 The participants were Vasudev Iyengar IX A, Prathoush IX C, Maanav IX D, Vishvajith IX A, Sarvesh VI B, Praveen IX B, Parikshith IX A, Umesh VII C, Satya Lohith VII C,R Aravind IX D, Sai Azad IX D, Akhil IX D. Congratulations to the Prize winners. 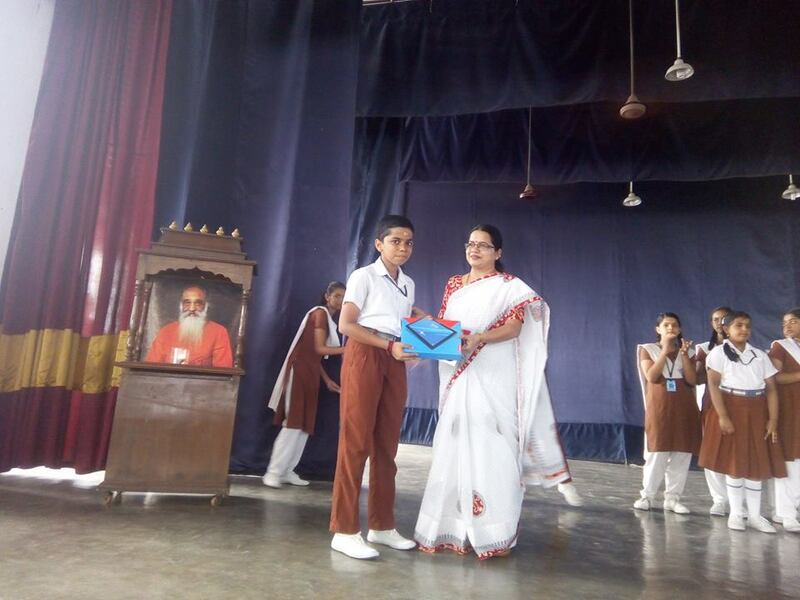 We are proud to announce that our school got, over-all III position in the Interschool Gita Chanting Competition which was conducted for schools all over Chennai. More than 100 school participated in this event. Congratulations to the prize winners and the Sanskrit Department teachers who have given their contributions support in training the students throughout. 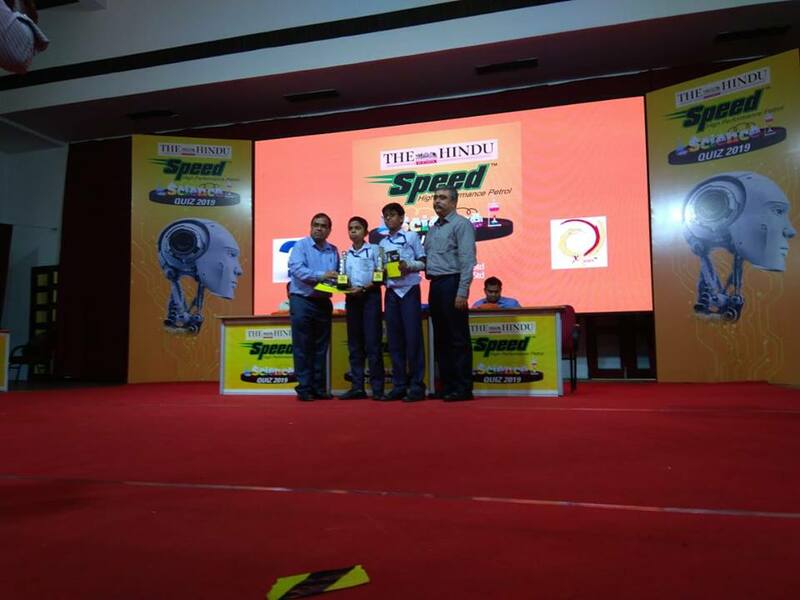 “The Hindu” along with “Speed – High performance petrol” of Bharat Petroleum conducted an Inter-school Quiz competition on 1.2.2019 (Friday) at SBIOA School & Junior college , Annanagar chennai. 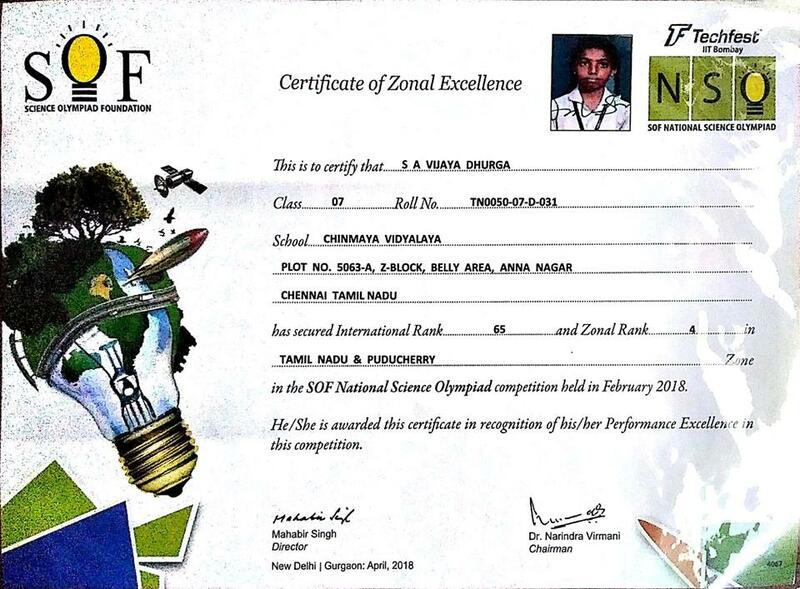 It’s a Quiz based on General Science, participants from all over Tamil Nadu participated in this Quiz which included a preliminary round of written test with 20 questions. 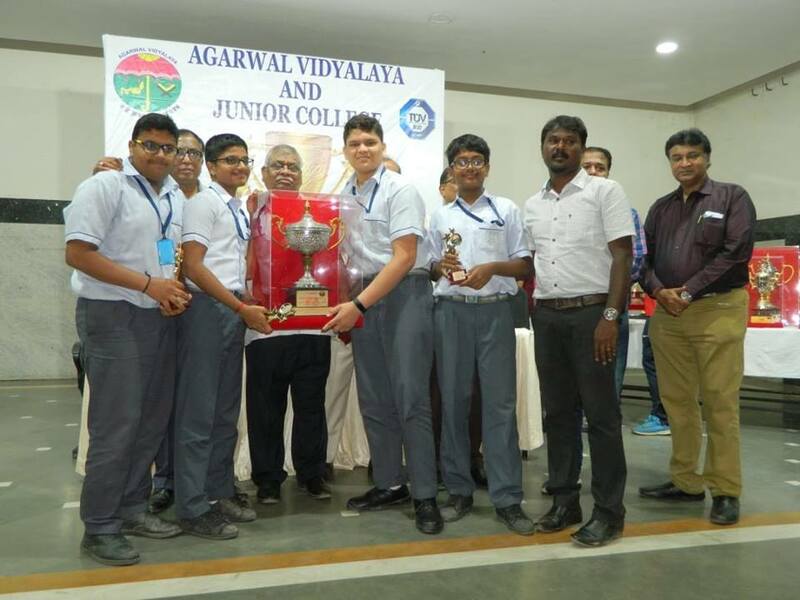 In senior category Chinmaya Vidyalaya Annanagar Students Vijay samuel and Abhimanyu A of Std VIII stood II and won the second prize in the final round. 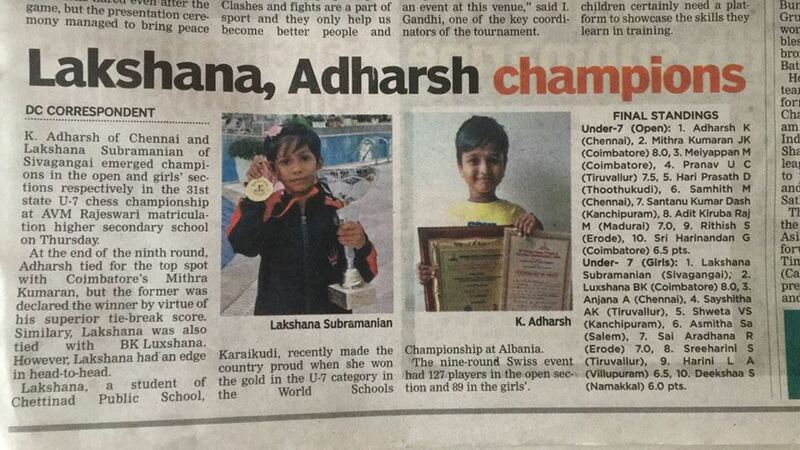 In Junior category Tharun Vishwanath and Aakansha Ramakrishanan of Class VI from our Vidyalaya won the 5th place. 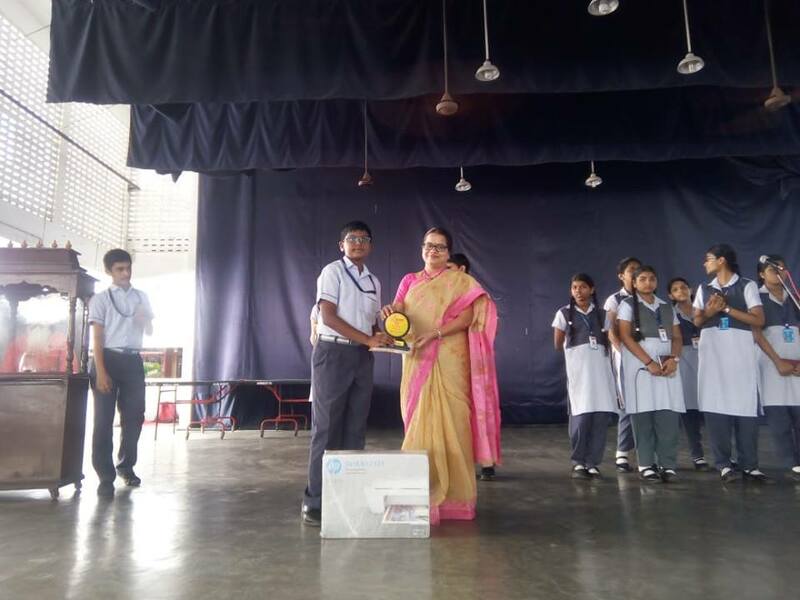 Students who notched the top place were awarded a trophy and a certificate. Congratulations to the prize winners. 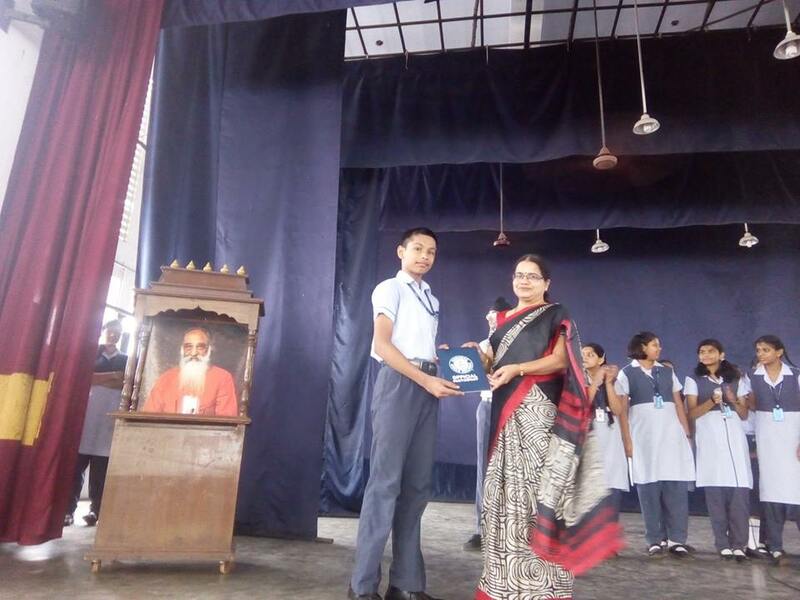 The Sindhi Model school, CBSE, located in kellys conducted Inter school Cultural events on the 29th January 2019. A big group of enthusiastic students from classes I to V participated in the exciting events like clay modelling, group dance, group song , ramp walk, cooking without fire , elocution, hand writing , wealth out of waste etc. With in a short span of time, the students were able to organise and practice for the events. 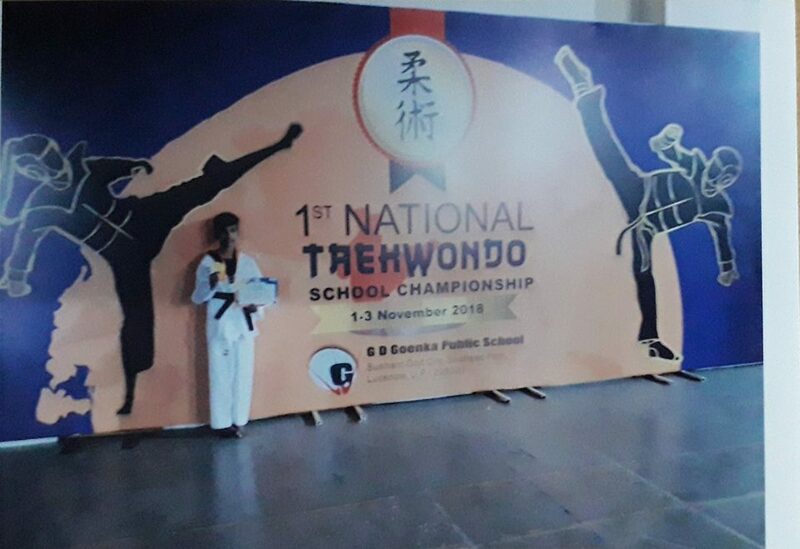 P S THVARITA RAO of Std VIII –C , won the GOLD MEDAL for (U-14), U-32 kg weight category in the 1st NATIONAL TAEKWONDO SCHOOL CHAMPIONSHIP 2018 - conducted under the aegis of SGFI (School Games Federation of India) at GD Goenka Public school, Sushant Golf city, Lucknow. 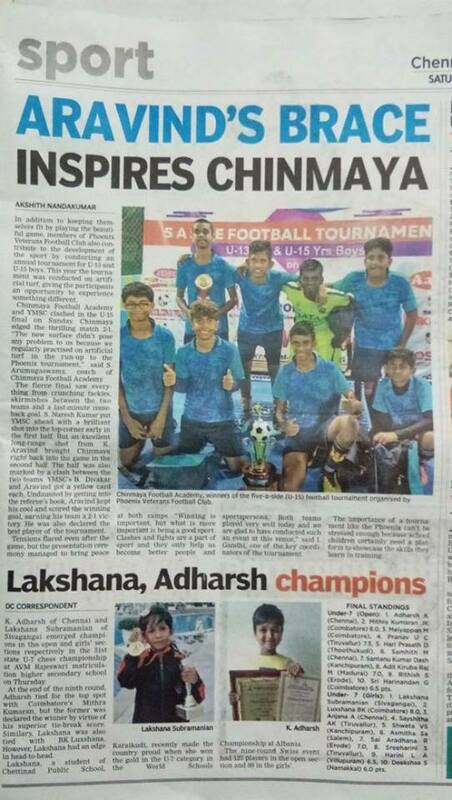 The championship was conducted for students from all over the country. 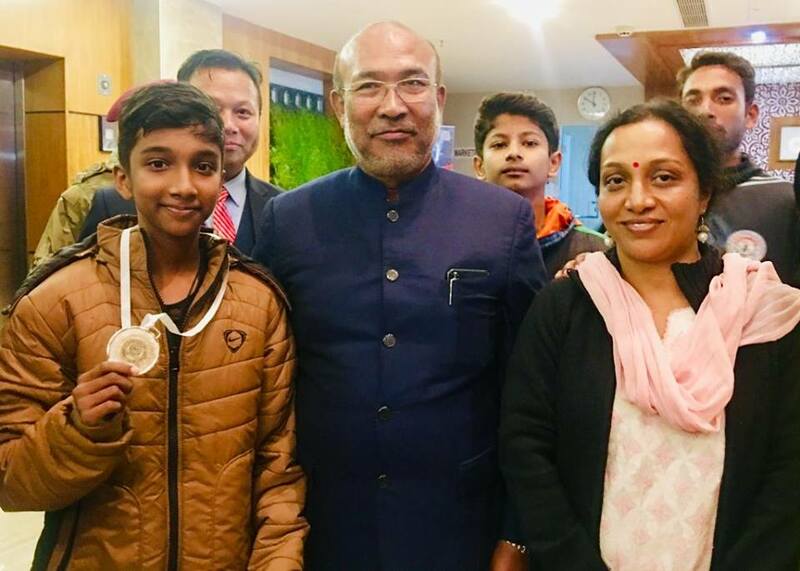 The Gold medalist Thvarita Rao participated in the SGFI National Championship held at Manipur from 25th November to 30th November 2018. 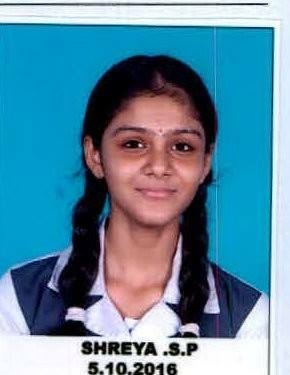 She won the silver medal at the 64th NATIONAL TAEKWONDO SCHOOL CHAMPIONSHIP. 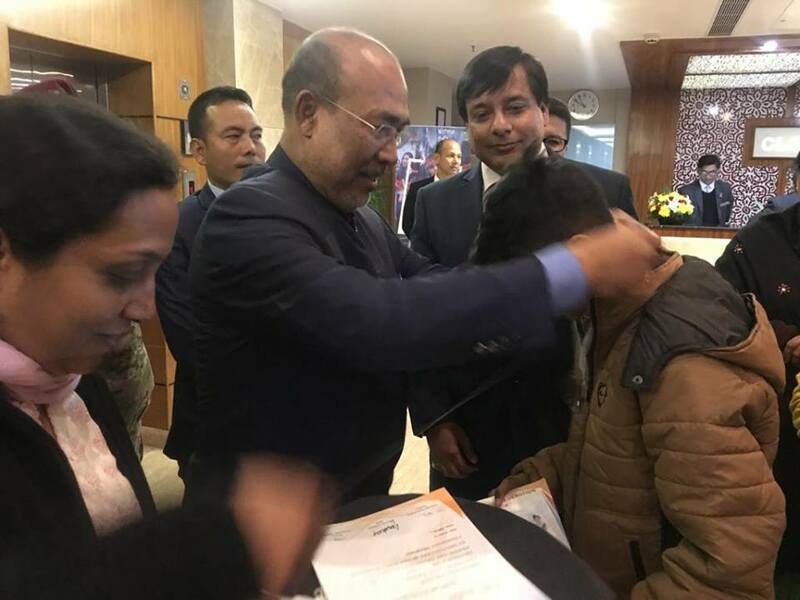 She received the medal from the Chief Minister of Manipur. She has been selected for the world combat sports Games to be held at Hungary during July 2019. Congratulations and best wishes to P S Thvarita Rao. 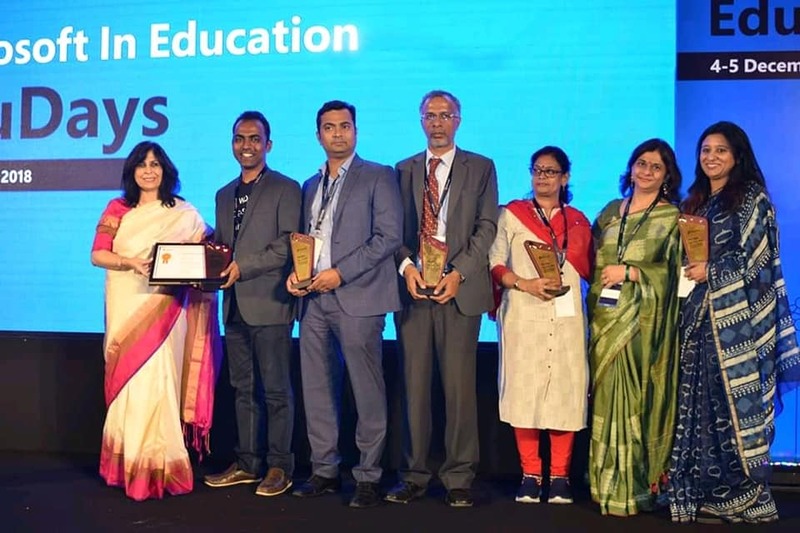 Mrs. T.Hemamalini from Computer Science Department, who is a Microsoft Innovative Educator Expert (MIEE) of our school was selected to take part in Edu Days Event organized by Microsoft on 4th and 5th December, 2018 at Gurgaon. 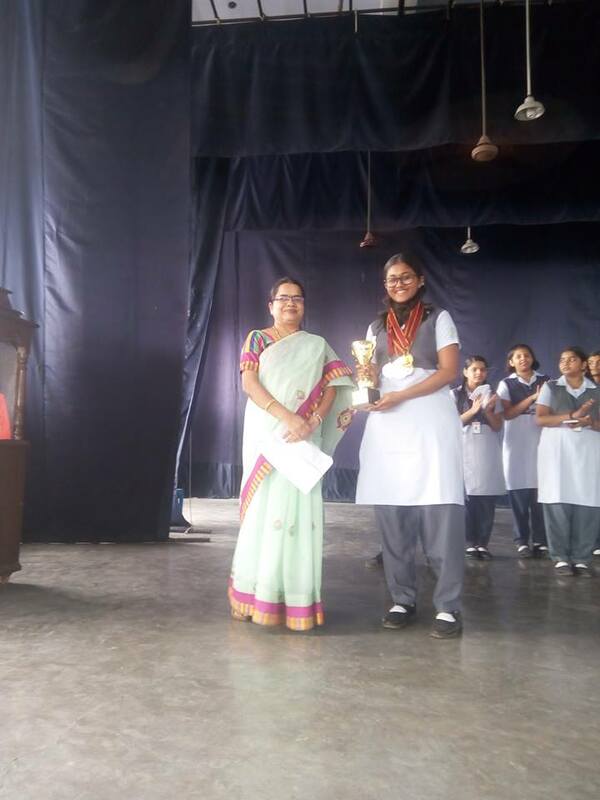 She along with her team members from different parts of India, collaborated on many Skype sessions and showcased a project on the topic-Let’s cross the borders- Safe and Secure, under Delocalize category, and their team won the first prize. 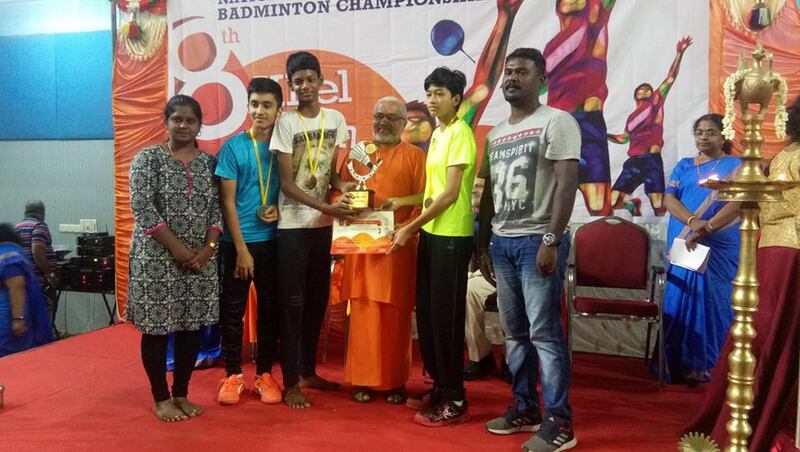 CBSE south zone badminton tournament for the year 2018-19 was conducted by Sri Sri Ravishankar Vidya Mandir Bangalore, Karnataka from 10.10.18 to 13.10.18 in which Somanath D Pai XI-C, Sandeep Krishna IX-D and Shasvat Vijay X-B won the bronze medal in the Under 17 Boys Category. I R Keerthi Laxmi VIII- A, N A Saranaya VIII- B, Neha B VI- A and Anumitha Rajesh VII -D won the Bronze medal in the Under 14 Girls category Congratulations to the teachers and the students. 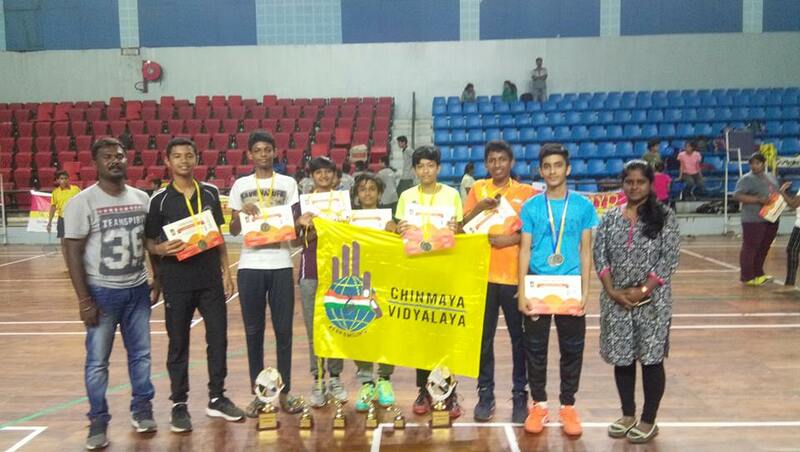 All India Inter Chinmaya Badminton tournament 2018 (Khel Milan) was conducted at Chinmaya Vidyalaya, Kunnumpuram Trivandrum, Kerala from 15.11.2018 to 17.11.2018. 30 teams participated in this event. 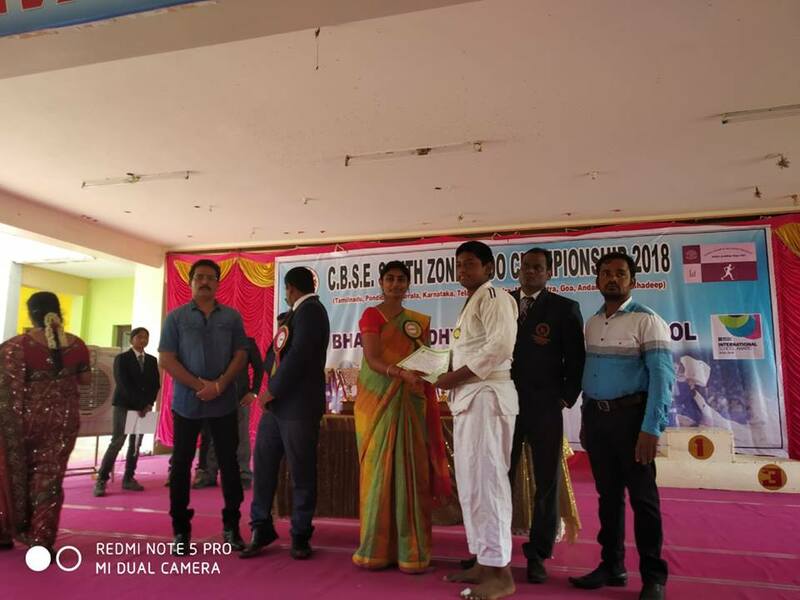 In the Senior team championship our team were the winners comprising of Somnath D Pai XI-C, Sandeep Krishna R IX D, Saranya N A VIII B and Neha B VI A .In the Individual championship Somnath D Pai was the Runner up and Saranya N A was the winner. 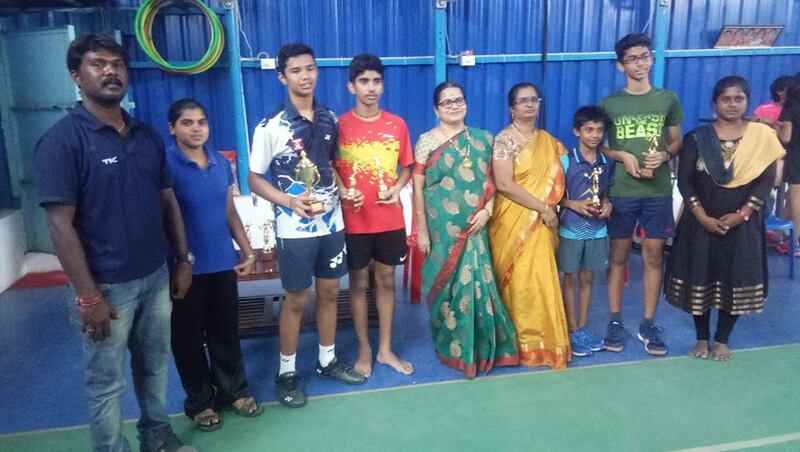 In the Junior team championship the team comprising of V Shasvat Vijay X-B,J S Mukund Dev VIII-B and I R Keerthi lakshmi VIII-A were the winners. In the Individual championship V Shasvat Vijay X-B and I R Keerthi lakshmi VIII-A were the winners. Congratulations to the students and the teachers. 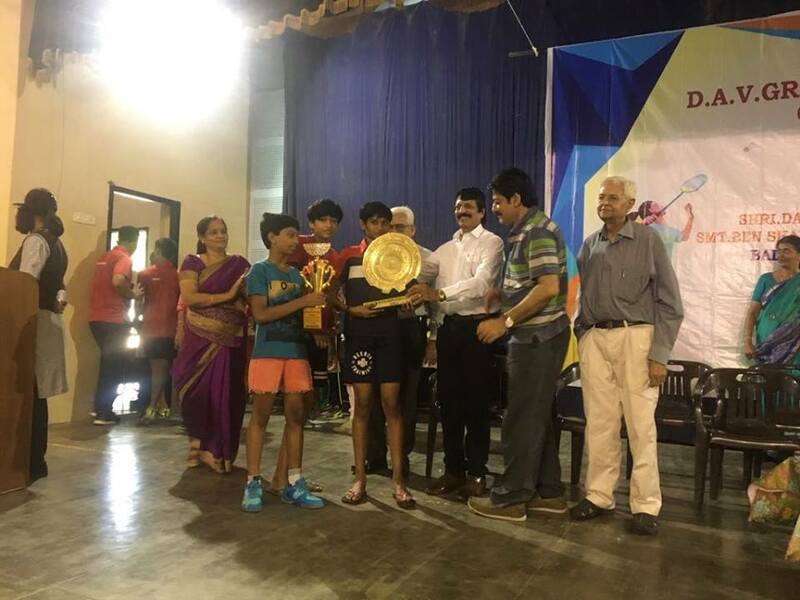 State level sports festival 2018 was organized by Tamil Nadu Dr. Baba Saheb Ambedkar Youth Sports and Cultural Organisation for Badminton, in which 30 schools participated in the under 14 category. 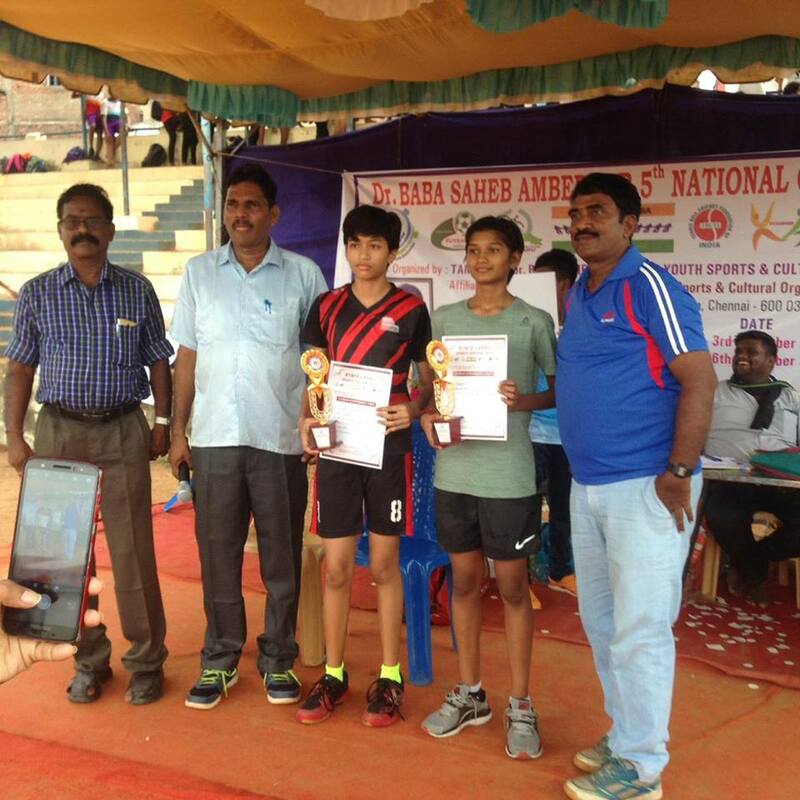 Our students I R Keerthi lakshmi VIII-A and Saranya N A VIII B secured the 1st Runner up position and they were selected for the Nationals to represent Tamilnadu team which will be held at GOA. Channel surfing I prize -Shreya , Vishnu, Samaran, Somnath and Venkatesh. 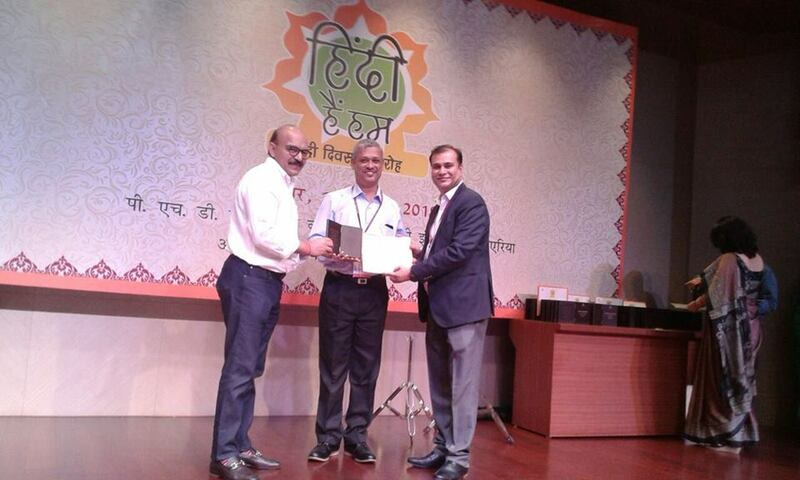 Our Hindi Teacher Dr. N Srinivasan- HOD of Hindi department was honoured by Madhuban Educational publication and awarded Best Teacher award on 14th September on account of (Hindi Diwas) which was held at PhD chamber of commerce New Delhi. 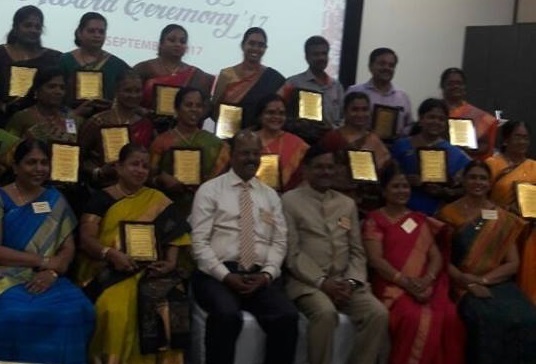 140 Hindi Teachers all over India was honoured on that day. 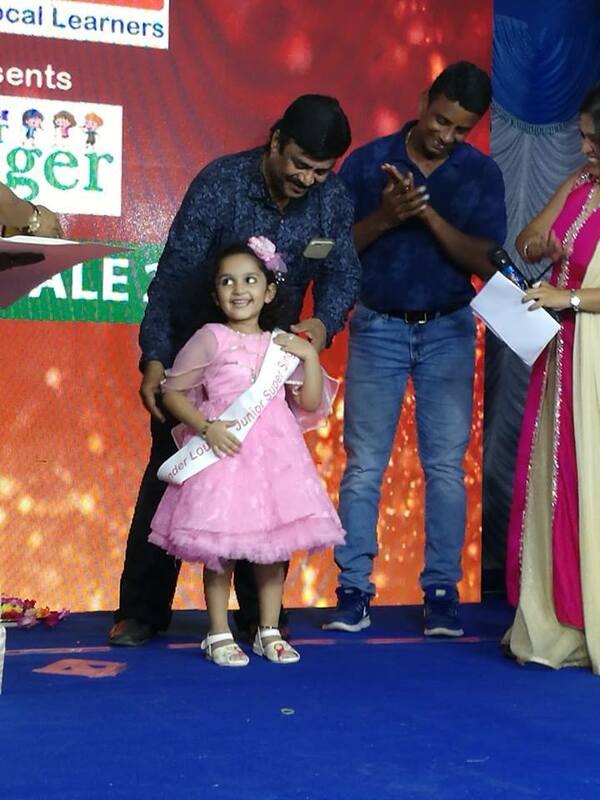 The Chief Guest for the function was Mr. Naveen business head Madhuban educational group and Mr. Jhunjhunwala executive director of S.Chand group. State level Quiz on General Science was conducted by FIITJEE. 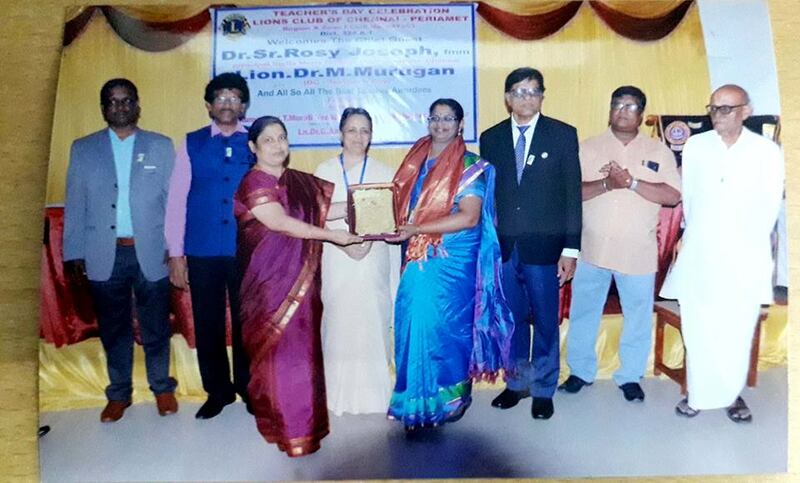 The final round was held on 14th April 2018 in Sir Pitty Thyagaraja Hall, T Nagar. The prelims were 6 months of online quizzing. The Grand finale had a written prelims and an onstage live quiz. 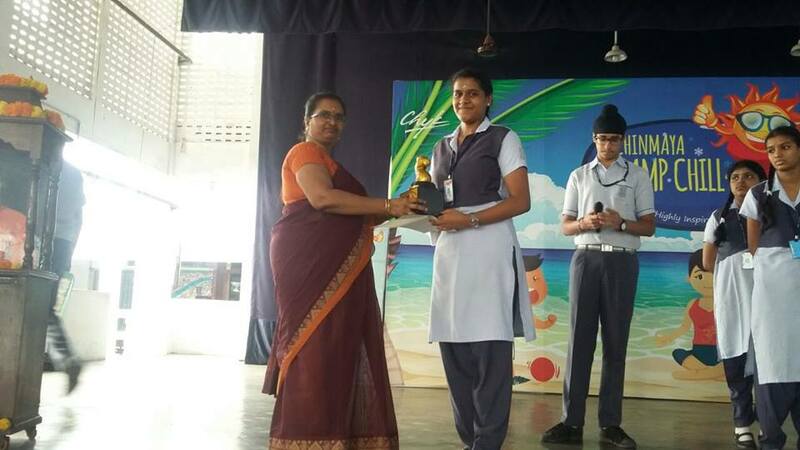 Mrs.Rita Pethe , the dance teacher of Chinmaya Vidyalaya received the Best Teacher Award from West Chennai Sahodaya Cluster Schools at Chinmaya Vidyalaya,Taylors Road on 07.09.2018 which was conducted by Chinmaya Vidyalaya, Virugambakkam. 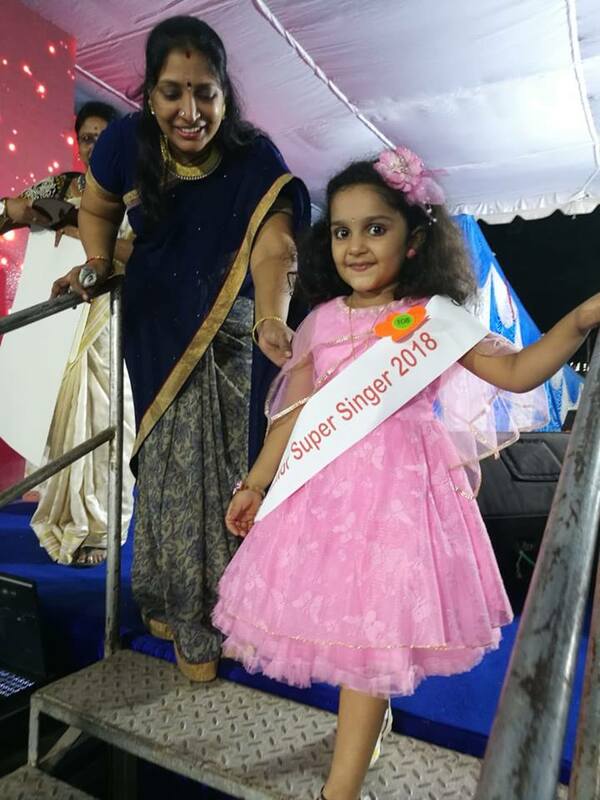 She has worked in the field of education for 20 years and has been teaching dance and piano to student’s right from Kindergarten to Std XII. She has also choreographed many programmes in and outside the school and won many accolades. 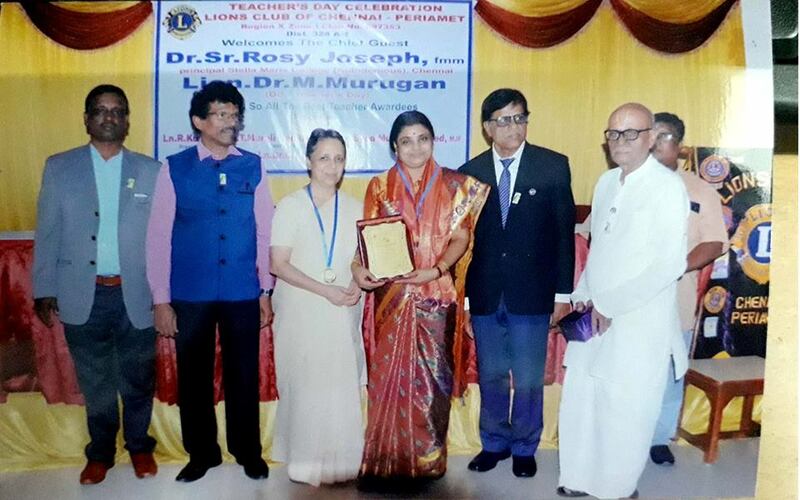 Mrs.Shanthi Muralidharan from Tamil Department who has 25 years of service in the field of education and Mrs.Rama.B from Social Department with 22 years of service received the Best Teacher Award from Lions Club Periamet,Chennai District, on 5th September 2018 at an award function held in Hotel Ashoka , Egmore. 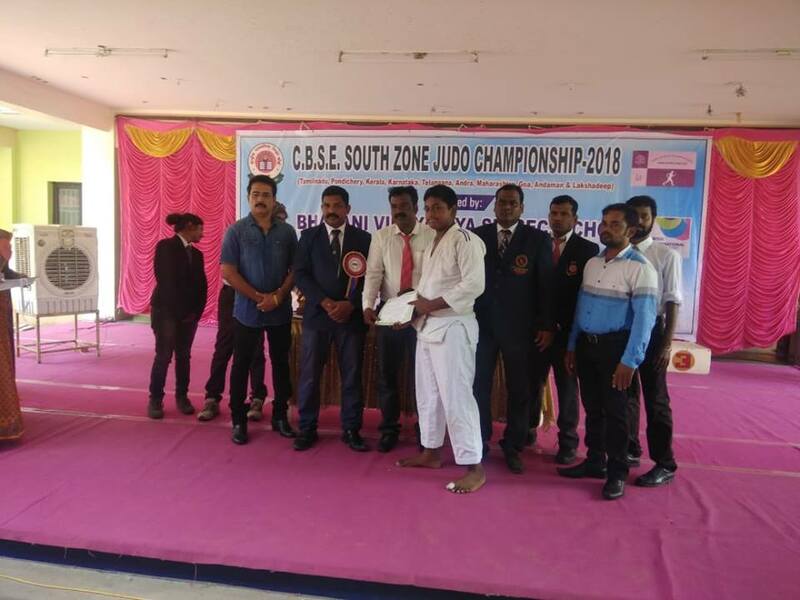 Bharani Vidyalaya senior sec school-Karur conducted south zone JUDO tournament. 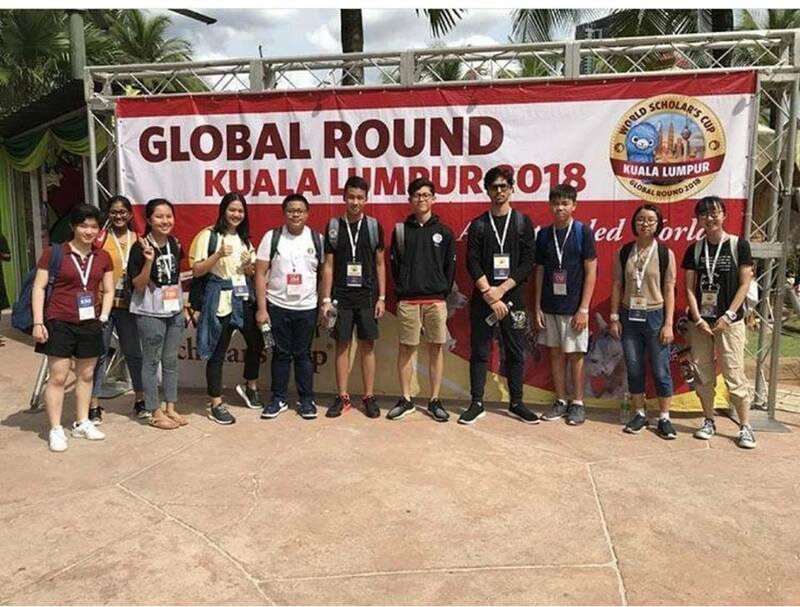 Students from Tamil Nadu, Pondicherry, kerela, Karnataka, Telangana, Andra Pradesh, Goa, Maharashtra, Andaman Nicobar and Lakshadweep participated in this event. 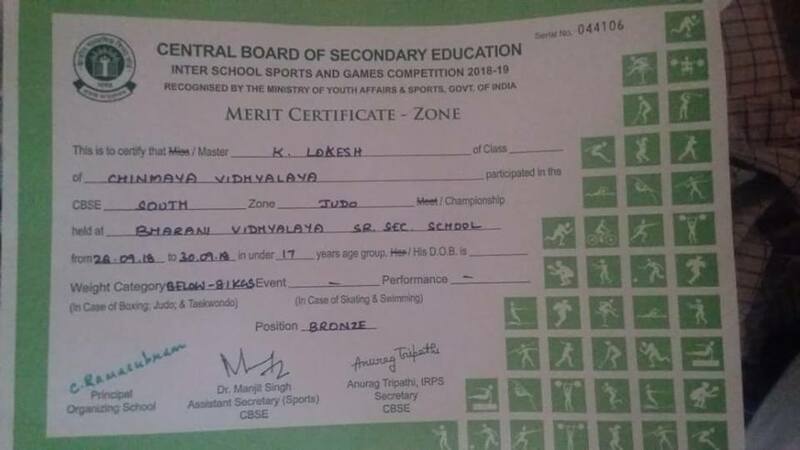 Lokesh of Class IX from our Vidyalaya secured bronze medal U 17 open weight category in this event. Congratulations and best wishes to him. 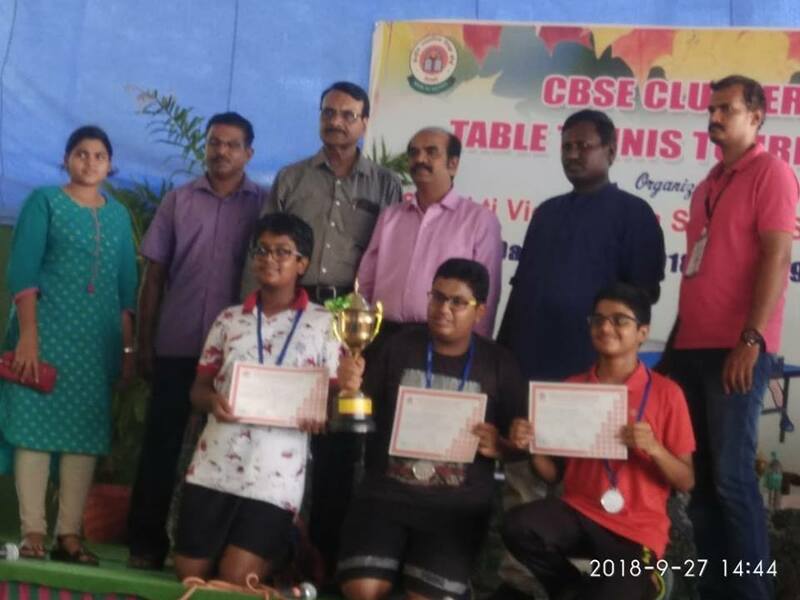 Our Vidyalaya students Hari Vignesh.U- X, Sanket mahipal -XI, Viswajeeth – VIII participated in CBSE Cluster VI (Tamil Nadu, Pondicherry and Andaman Nicobar) Table tennis tournament organised & conducted by Shristi Vidyashram- Vellore during the September month and bagged runner-up position in team championship . 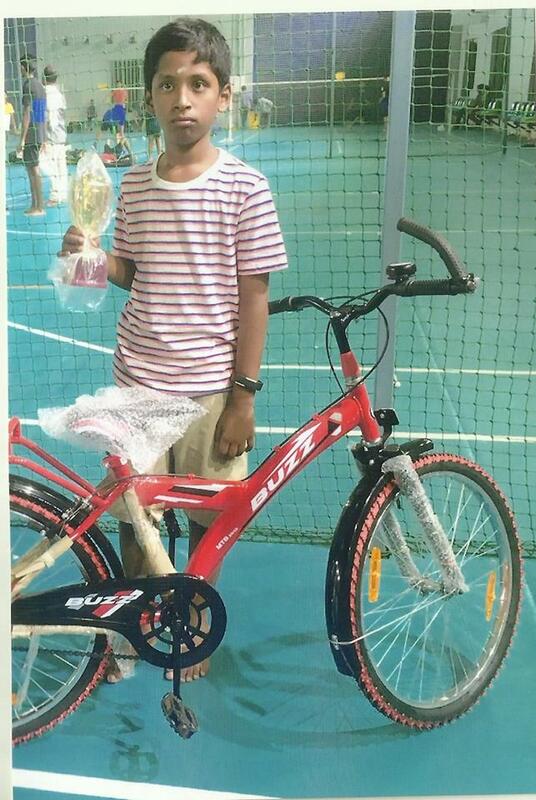 Hari Vignesh Umashankar has also received Runner up in Individual Championship. The same team will be participating in the National level during the month of November. Our Congratulations and Best wishes to the team members. 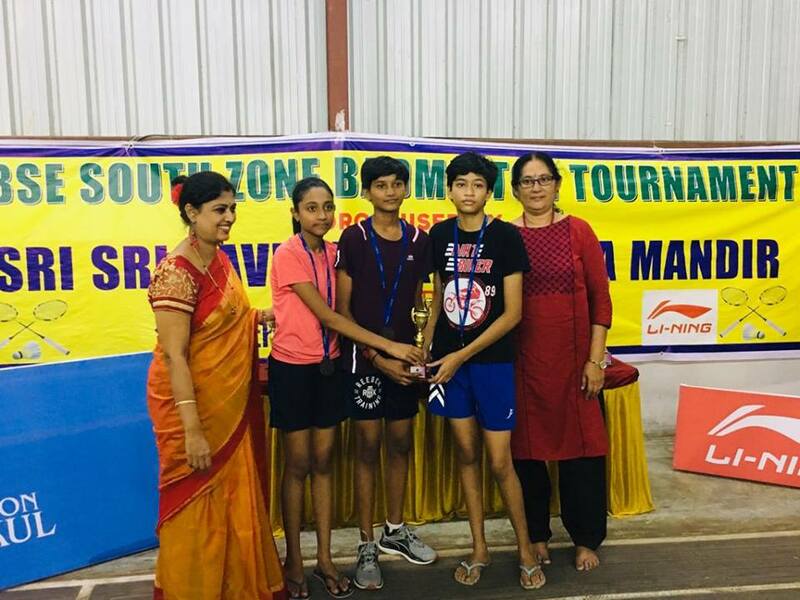 DAV senior sec school conducted 31st Smt.Ben Shanthilal Sharma memorial Badminton tournament for girls from 27/8/18 to 29/8/18 in which our school girls participated and won the I position out of 17 schools. 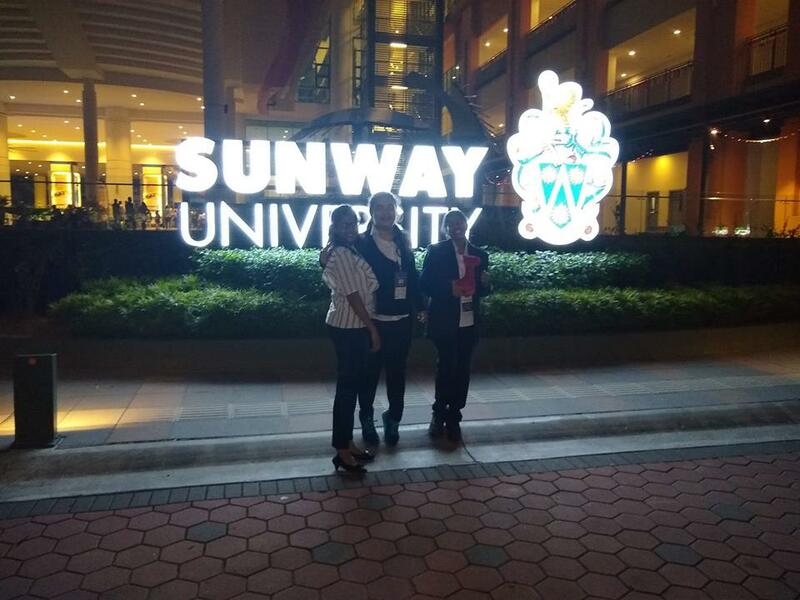 The participants were N.A Saranya VIII, Keerthi Lakshmi VIII, B Neha VI. 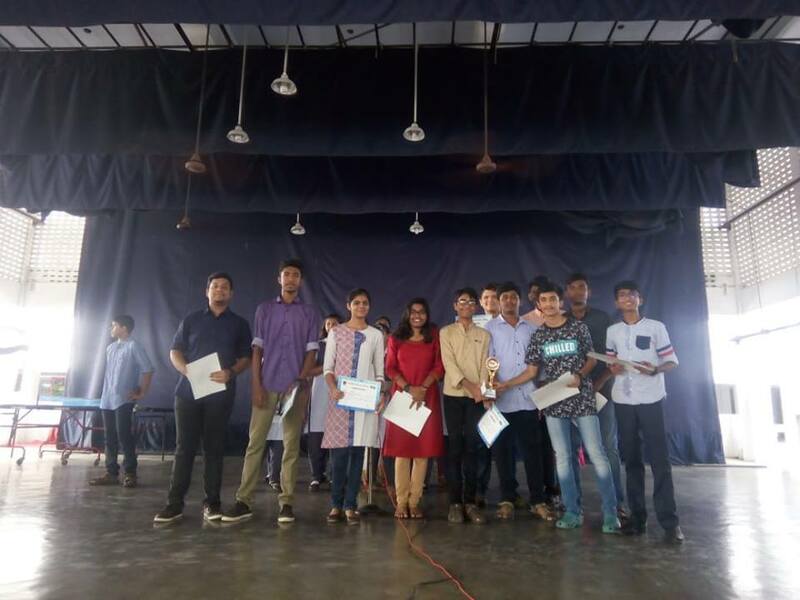 Britannia conquest I.Q Olympiad conducted Quiz competition in national level. 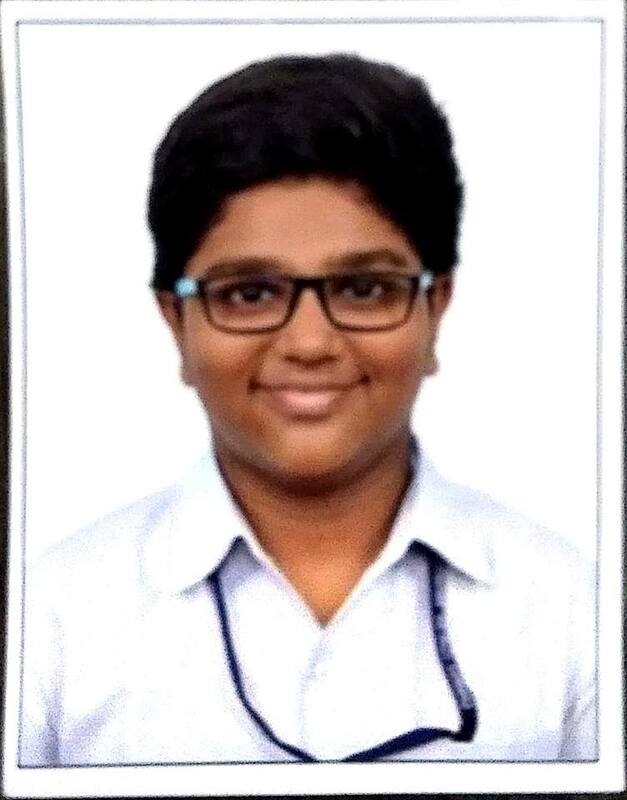 530 students from all over India participated, in which 150 students were selected for final round, C P Aravindan of std 6th Recieved 3rd prize in the finals and bagged H P Printer. 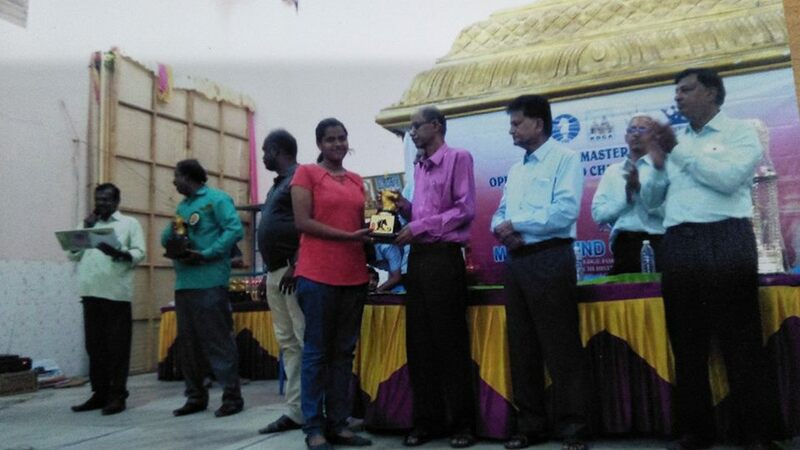 Oviya of Std II also recieved the printer as 3rd prize. 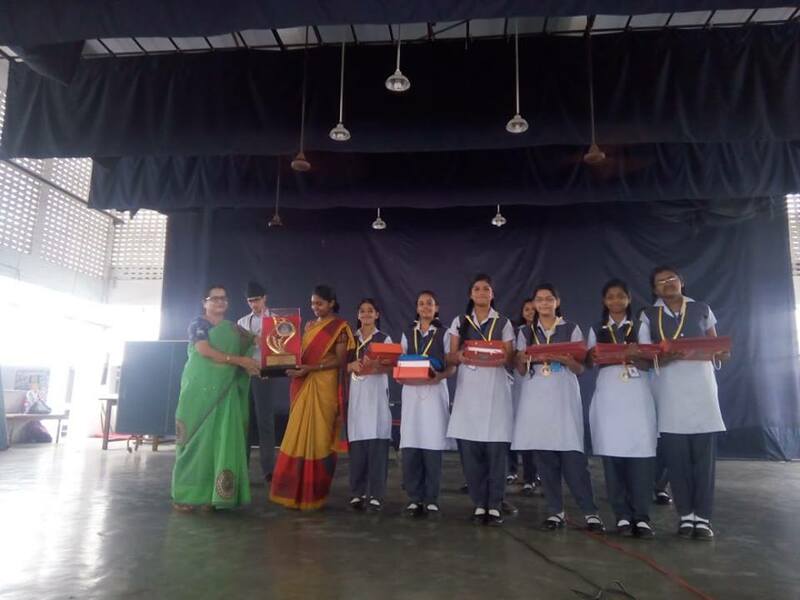 Sri Ganapathy Sachchidananda trust has organised a inter school bhajan Competition, In which our school choirs from Std VI & VII won the first prize. 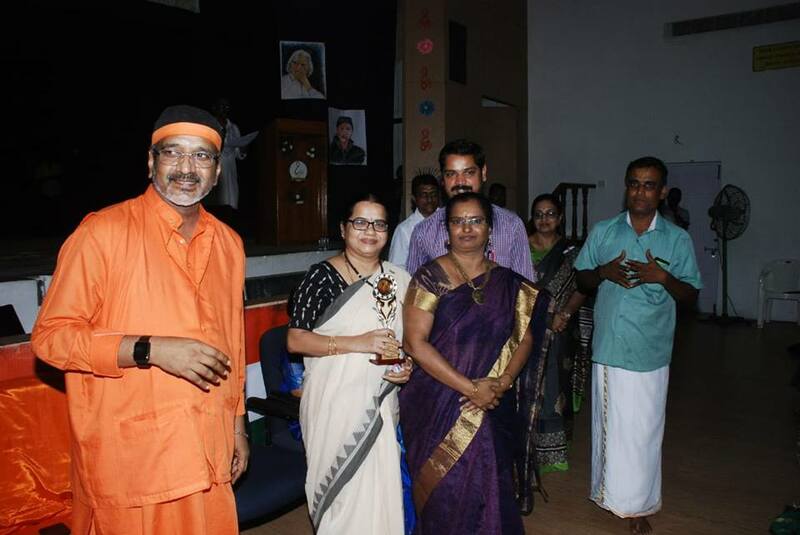 The participants were Thejashree S , Niranjani, Mangala Lakshmi, Sadhana & keerthana. 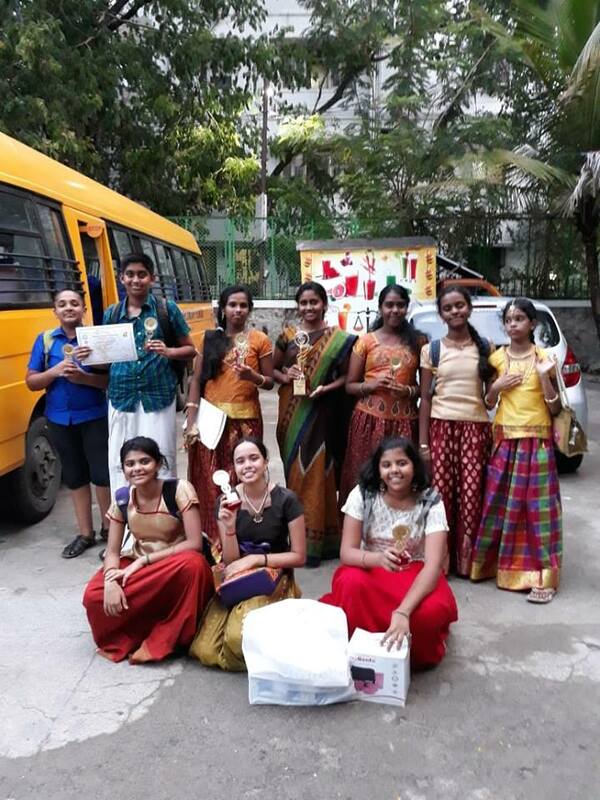 Congratulations to the participants and Music Teacher Ms. Naganandhini. 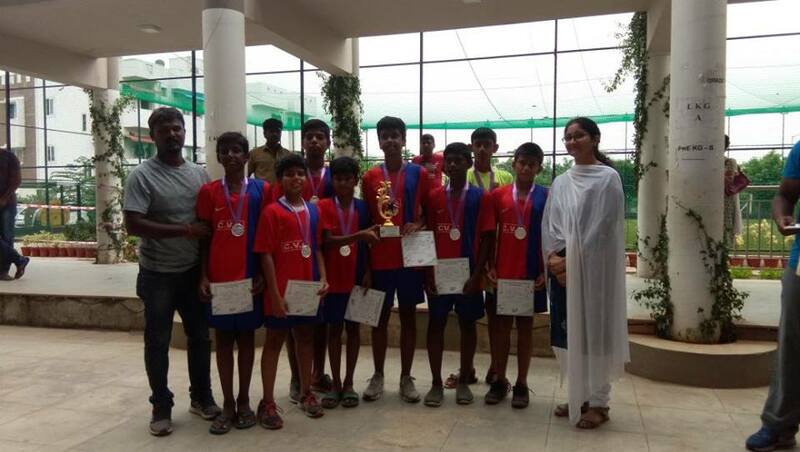 APL Global school conducted 5th Inter school Football Tournament which was conducted on 31st August and 1st September 2018 for U-14 Boys. 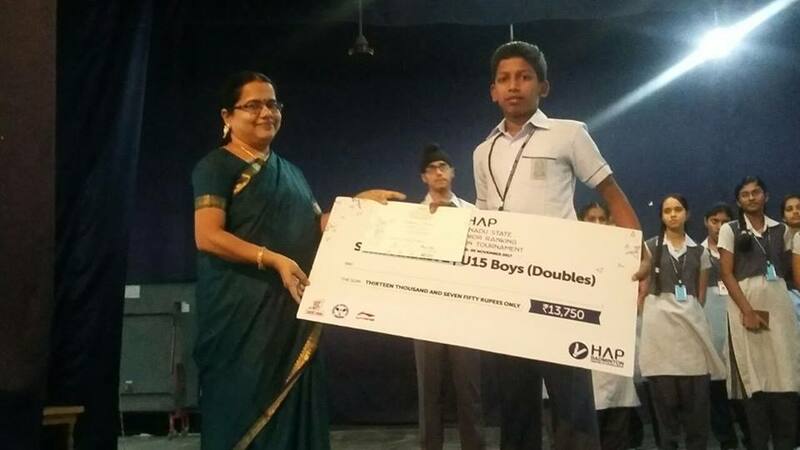 Our school Boys won the runner up position out of 30 schools. 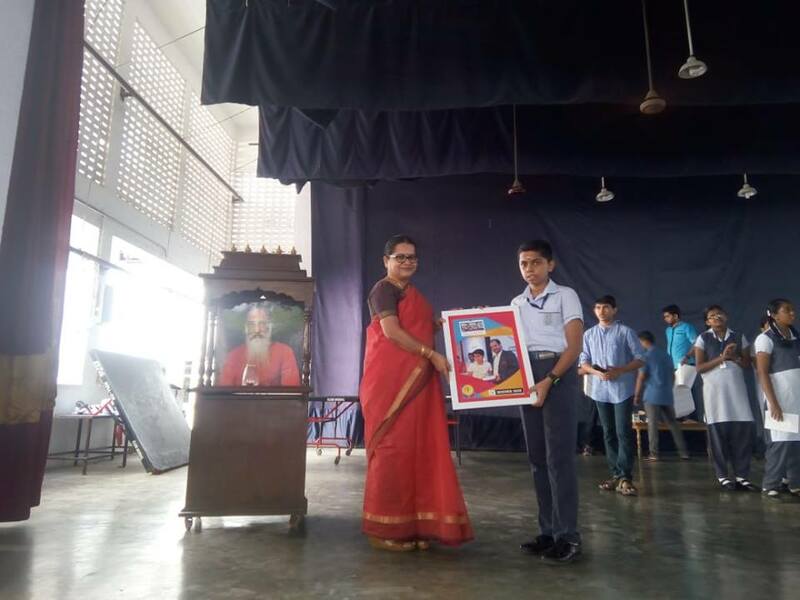 The participants were Aravinda Krishna - IX, Kuganeshwaran P- IX, Adithya. G - IX, Mohan raj- VIII, Sri jay Krishna - VIII, Singaram - VIII, Abhinav P -VIII, Nagulan S -VII, Vignesh k -VIII , Aparajith - VIII. Congratulations to all the participants and the P.T Teachers. 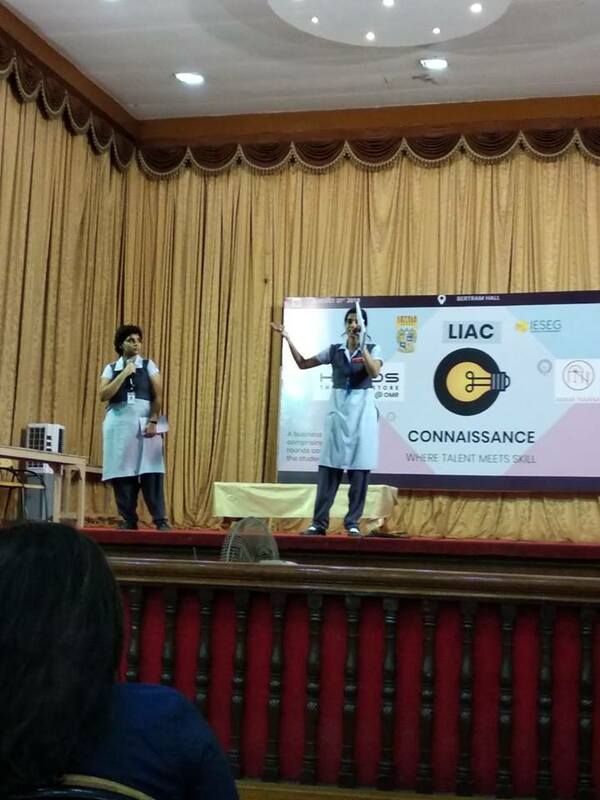 Loyola College, Chennai conducted ‘Connaissance 2018’, a business battle on 31st August. On various events like Debate, Quiz and Business Plan. 15 schools from the city level participated in this event. 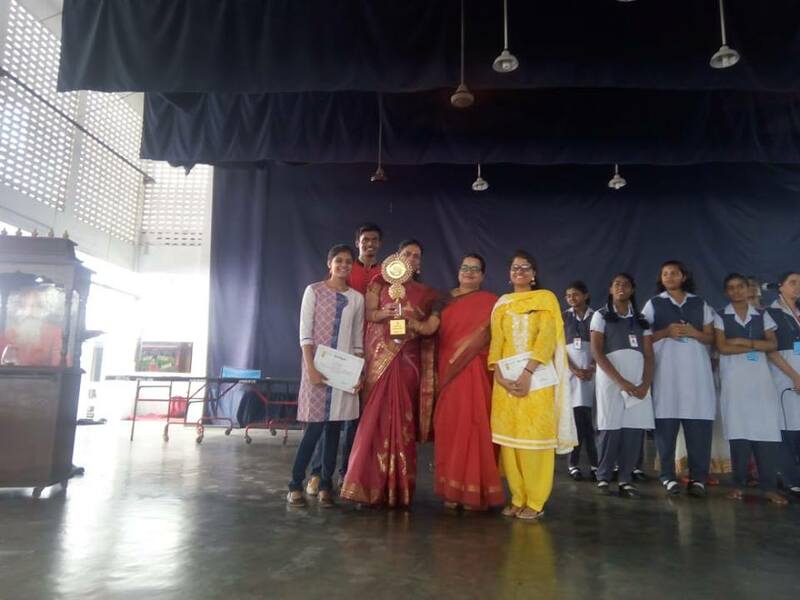 The participants were Teja XII- B, Shreya Sharma XII-B, Shreya S P XI-C, Yamini XII- B, Deshna XII –B from Commerce department won the first place in the Debate Competition. The school was also awarded the overall runners up trophy. 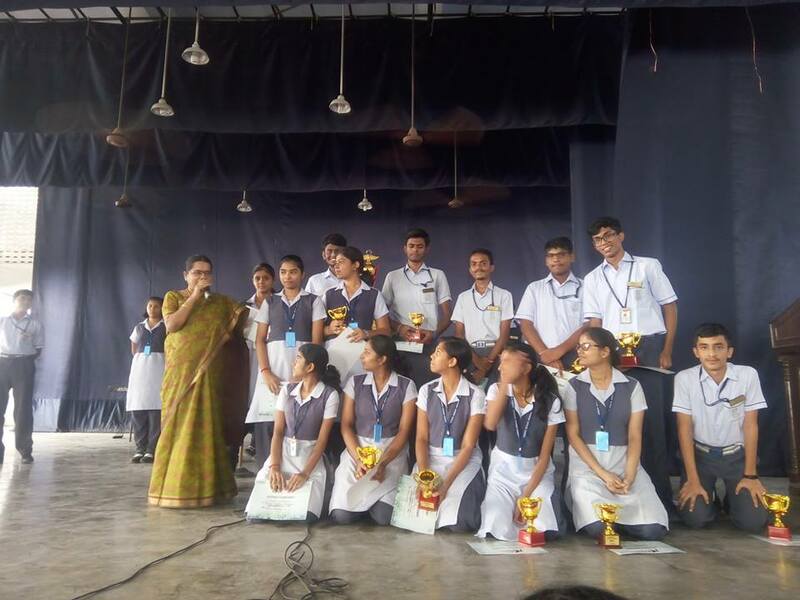 Congratulations to the participants and the commerce teacher Mrs. G Latha, who was the guiding force for them to win the prizes. 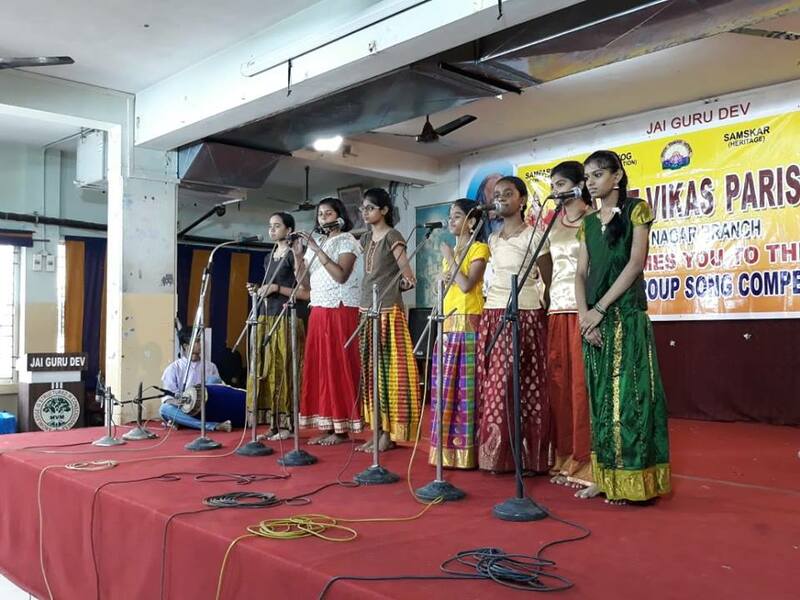 Students from Chinmaya Vidyalaya Annanagar participated in the National Group singing competition organised by Bharat Vikas Parishad on 04.08.2018. In the Hindi songs category (zonal level) our school students won first prize among 15 teams and qualified for the next level (state level) to be conducted soon. 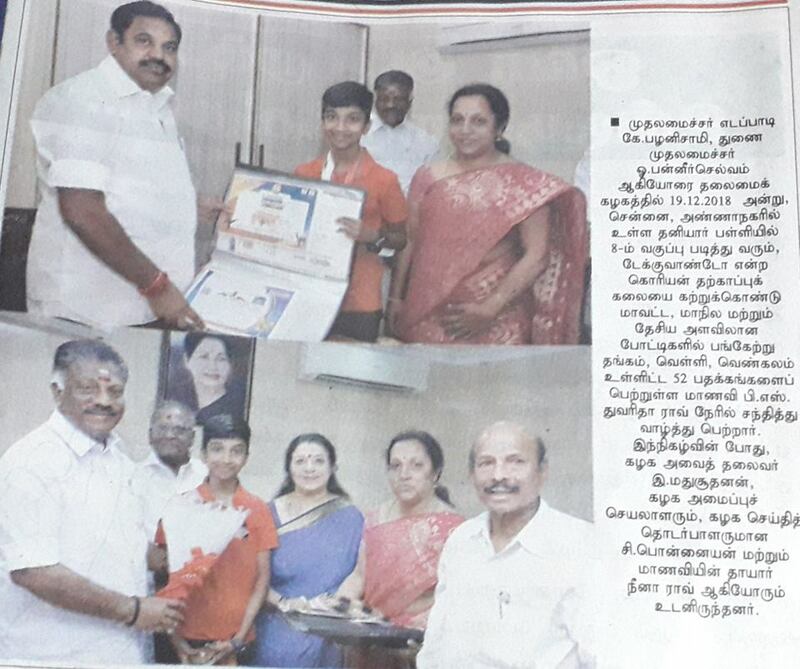 Congratulations to all the students and the Music teacher Ms. Naganandhini. Our Best wishes for their next level competition. 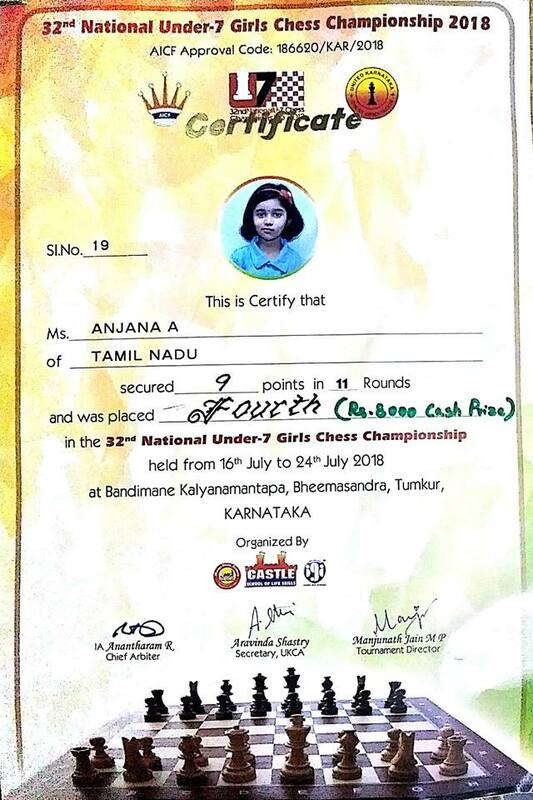 Anjana of class II D, participated in 32nd National Chess Championship, under 7 girls, which was held from 16th-24th July 2018 at Tumakuru, Karnataka. 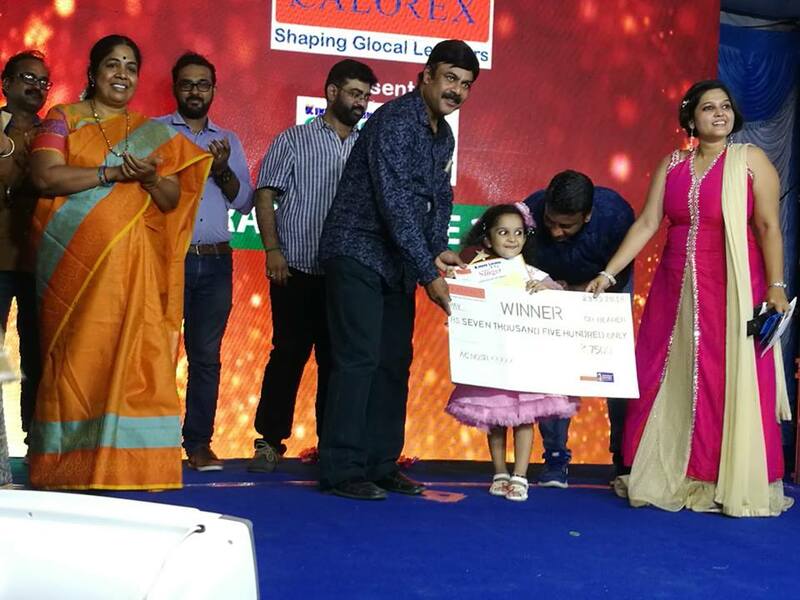 She won 4th place with a trophy and a cash prize of Rs.8000. Overall 148 girls from 22 states and 4 Union territories participated in this tournament. 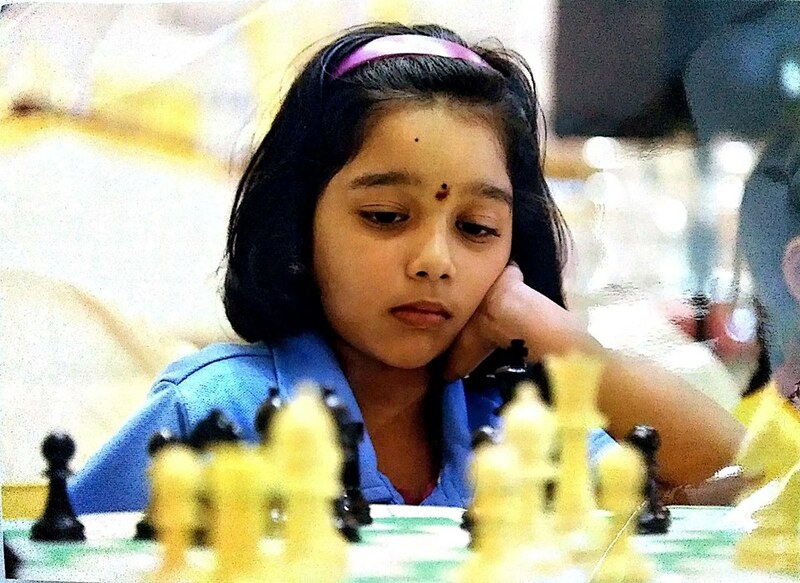 Anjana scored 9 points out of 10 and won 4th place. The greatest asset is a strong mind. If i know someone is training harder than I am I have no excuse.” – P V SINDHU Inspired by these words, Saranya N A of Std VIII thirst to succeed huge in badminton shooted up. She started working at least four hours a day. 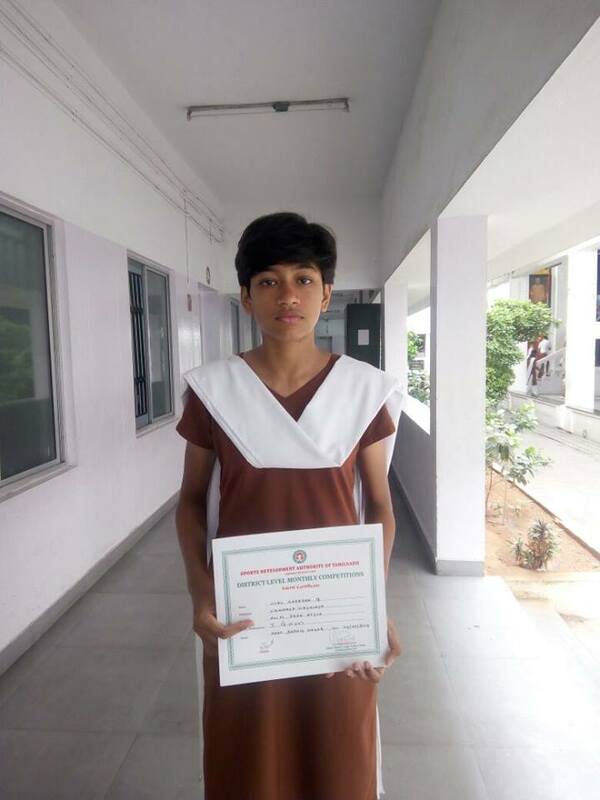 After continuous efforts, she won the runner’s position in the TAMILNADU STATE LEVEL TOURNAMENT conducted by YAAVARUM KELIR in which more than 200 students participated. 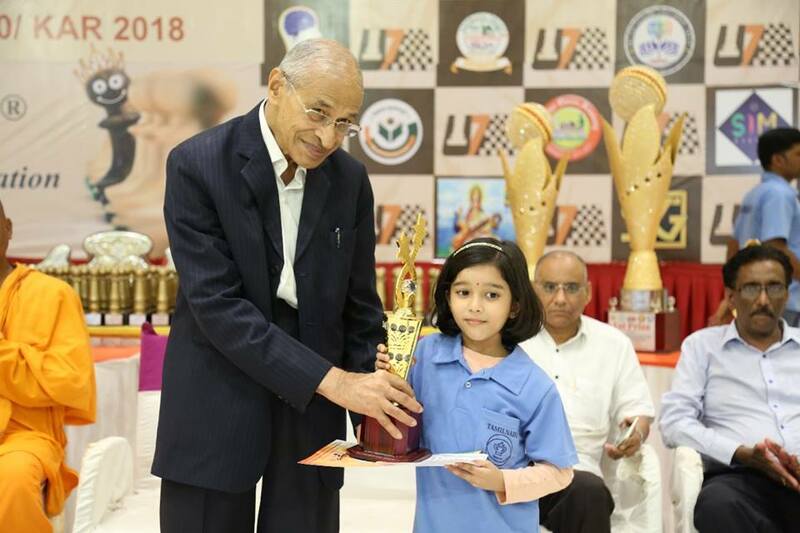 Recently, in a tournament conducted by THE COLOSSEUM SPORTS, She won the kid’s Singles-Intermediate category and runner’s position in the Mixed doubles category. 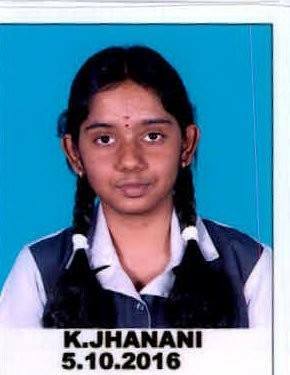 She was awarded with a cash prize of Rs.4000/-. She is determined to represent our Nation in the Olympics. Congratulations and best wishes to her. A Smooth sea never made a skilful sailor. Astra-2018 was an event that opened an ocean of opportunities that help our students portray their skills on 28th & 29th June at Bhavans Rajaji Vidyashram. 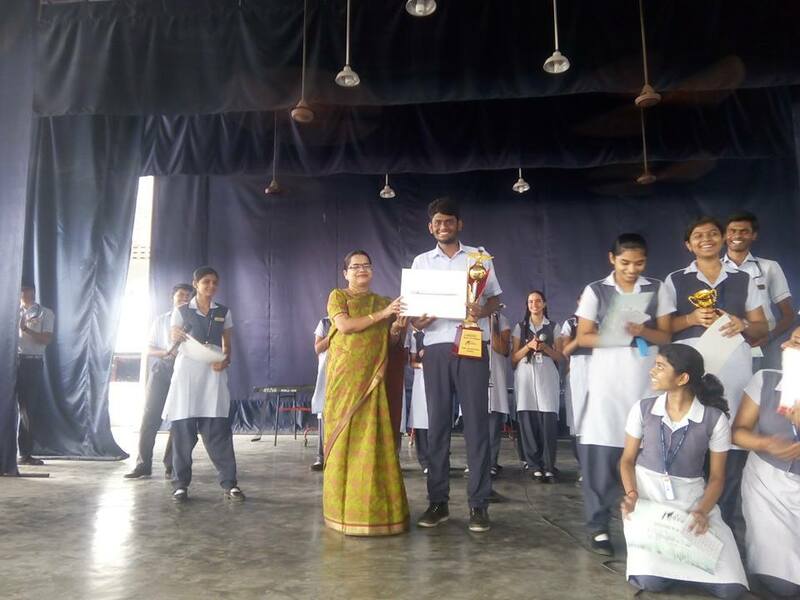 Samaran from 11 B had bagged the ‘ Mr. Astra title’ and had won exciting prizes like a macbook and cool headphones, on a whole this was a wonderful platform for the exposure to the students . The world scholars cup is a global level annual academic event. It includes writing, debating and 6 different subjects which include science, special area , social science, History, Art and Literature. 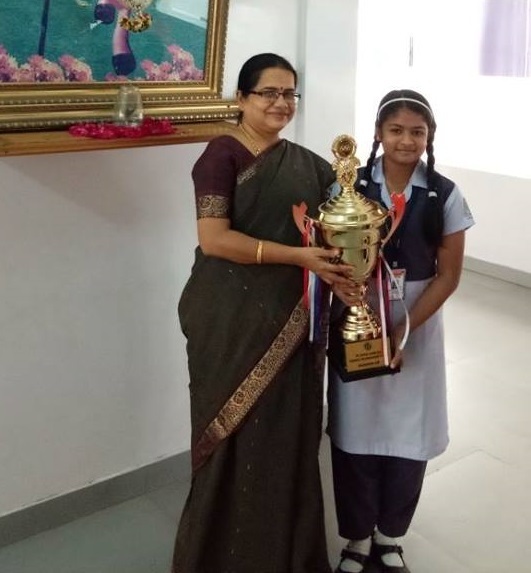 We are so proud to note that, Geetanjali of Std X-C of our school has remarkably secured the 9th position on the all Chennai Regional round, which was held in kualalumpur, Malaysia. This prestigious event was held with over 1800 seniors attending from 600 teams. 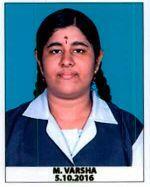 Geetanjali’s team stood 16th position in debate out of the 600 teams. She secured 6 medals in total 4 were gold and 2 silver medals. Debates (team)_-16th position out of 300 selected teams. Geetanjali’s team were also been invited to the final round called the Champions showcase in the yale university, conneticut, USA.Congratulations and best wishes to Geetanjali . Examination for the Second (2nd) CS Olympiad has been conducted in 1300 schools and more than 34000 students from different parts of the country had participated. 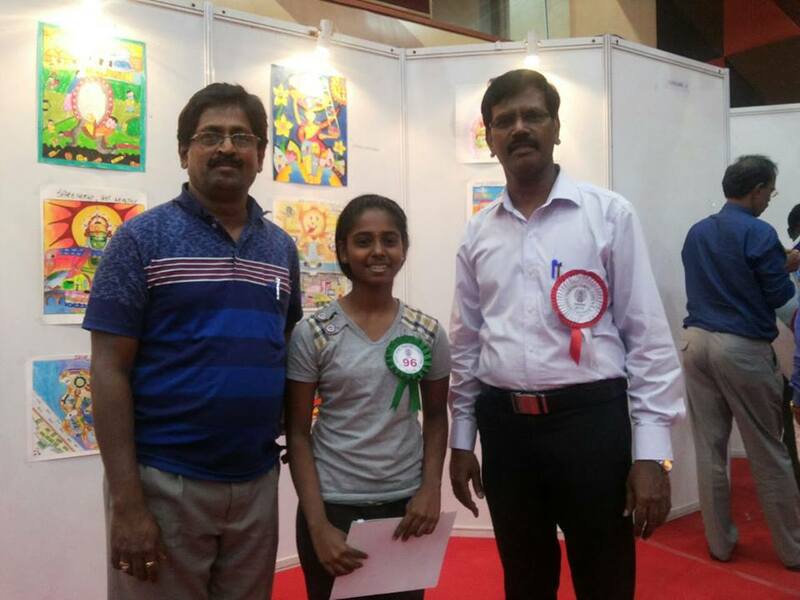 Ms. Varshini K from Class 12 and Ms. S Yamini from Class 11 participated and secured zonal 1st and 2nd rank respectively from Chennai. 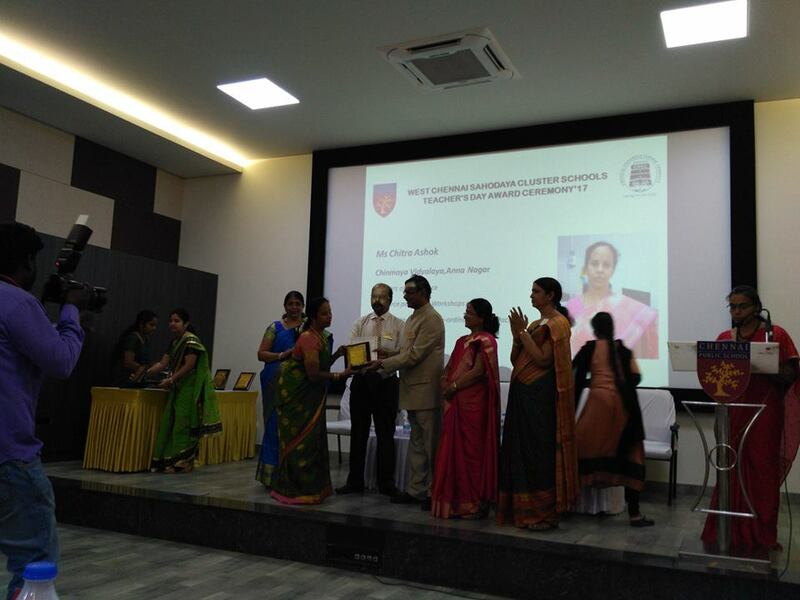 ICSI-SIRC distributed Certificate and an award amount of Rs. 10000/- and Rs. 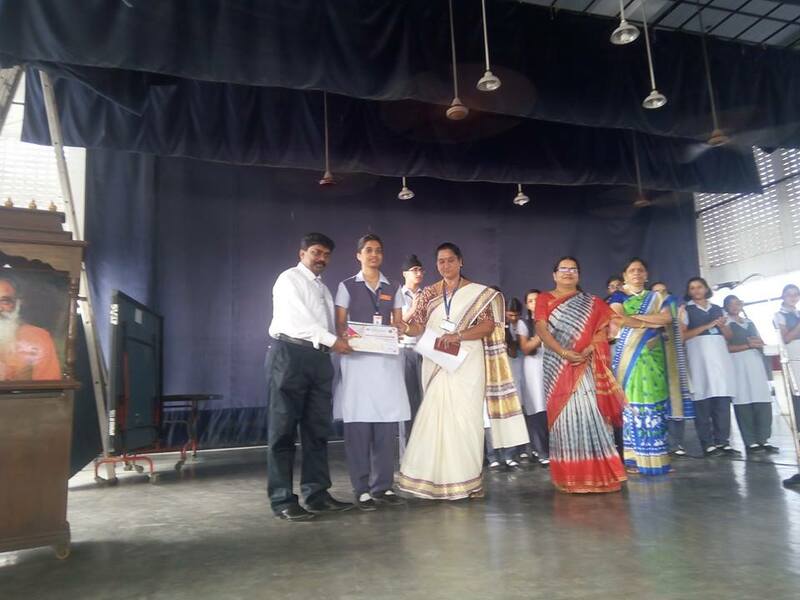 5000/- to Ms. varshini and Ms. yamini respectively on 19.06.2018 during the School assembly at Chinmaya Vidyalaya, Anna Nagar. 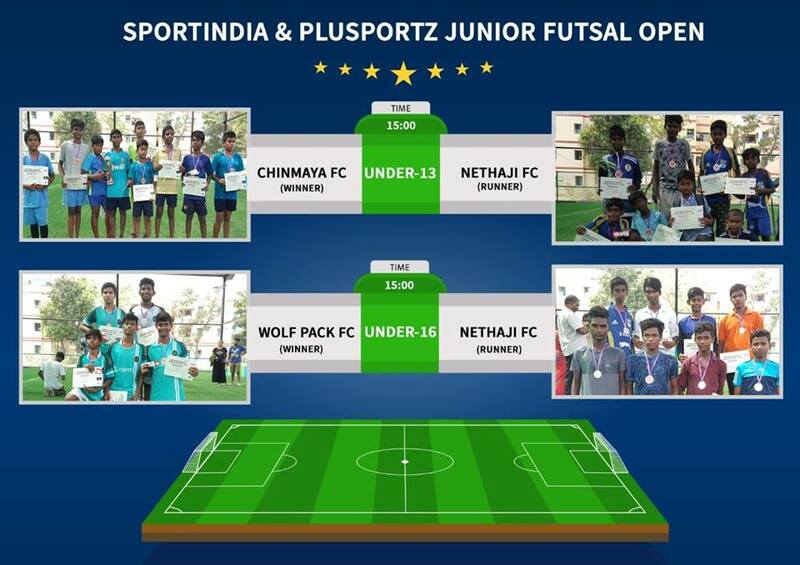 Our school Under-13 Football boys bagged the winner cup organized by Sports India and Plusportz Junior Futsal Open Tournament on May 19th 2018 at Plusportz Multi Sports Complex near K4, Police Station, Anna Nagar. They won against Nethaji Football Club. 16 teams participated in this tournament. Congratulation to the team members and the PT teachers. Our Congratulation to the School toppers & Subject toppers of Std XII & X–Board Exams 2017-2018. 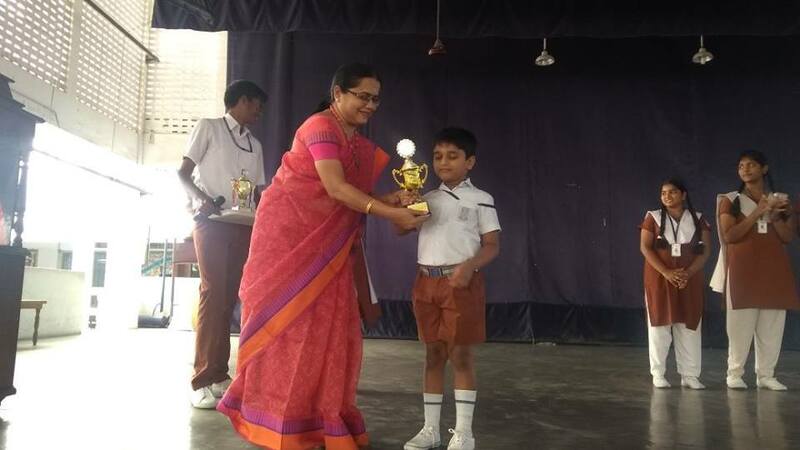 Adharsh studying in III Std, won the Championship title in 31st State Level U-07 Chess tournament held at AVM Rajeshwari Matriculation higher secondary school Virugambakkam. 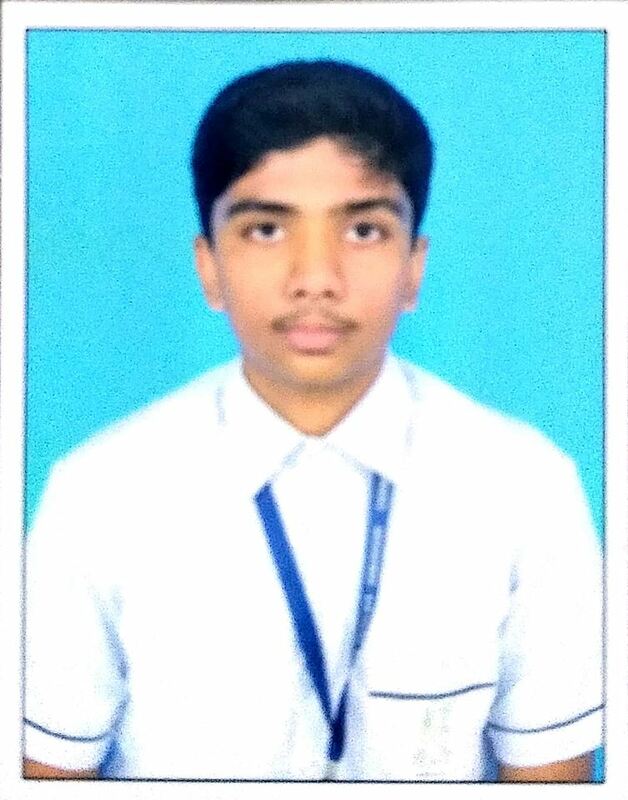 He is selected by the Tamilnadu State Chess Association to represent our State in the National Level U-07 Chess tournament to be held on Tumkur in July. 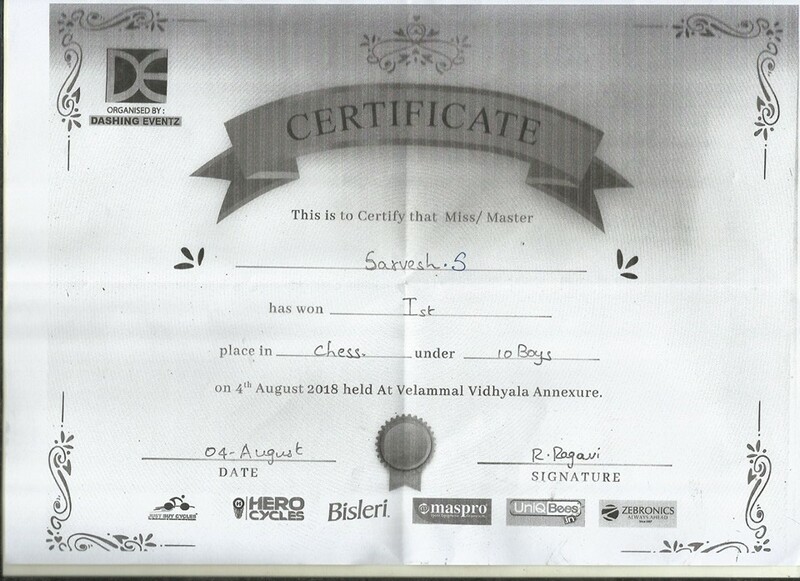 He has been attending Chess coaching for the past 1 ½ years. 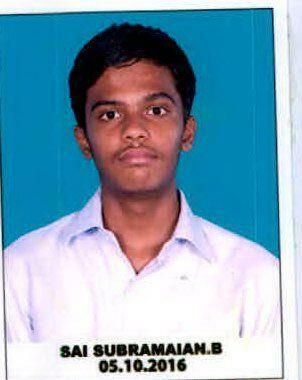 He is trained by Mr. Vijayanand - Vijayanand Chess Academy, Mogappair. 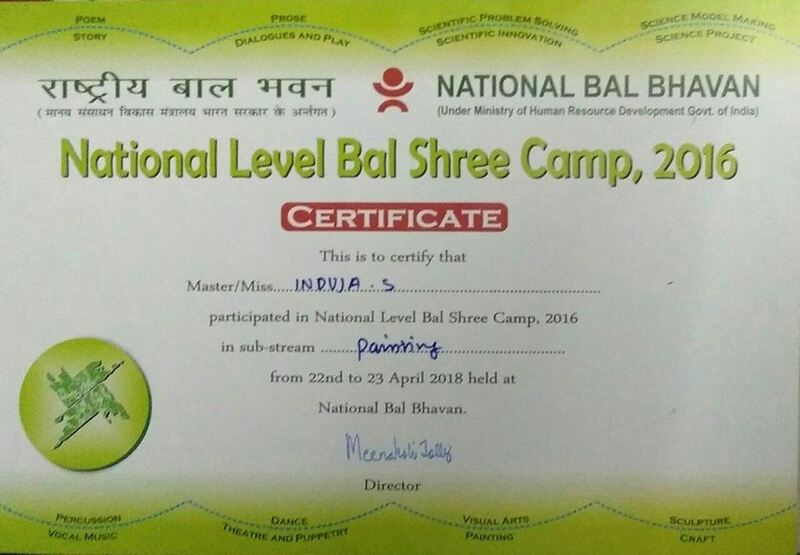 Induja S of Std XII was selected to participate in the National level Painting Competition, conducted by National Bal Bhavan, New Delhi, for the Bal Shree Award 2016. 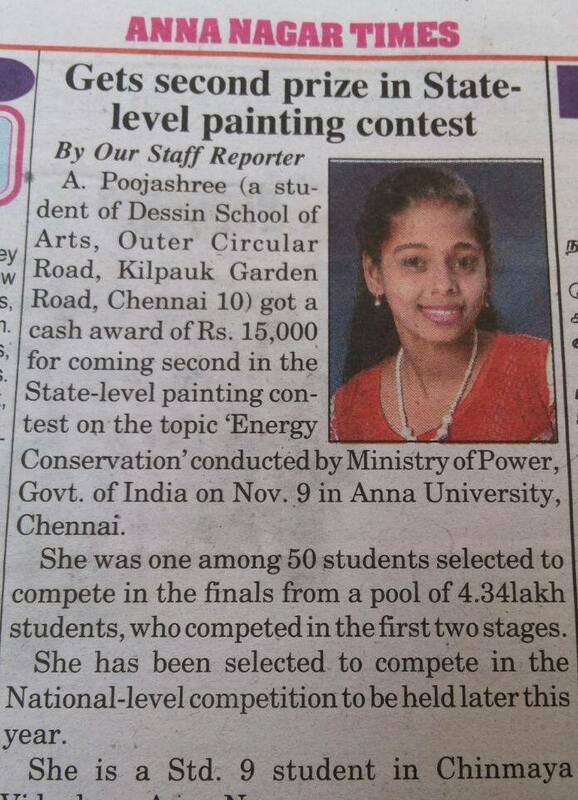 She was awarded a cash prize of Rs. 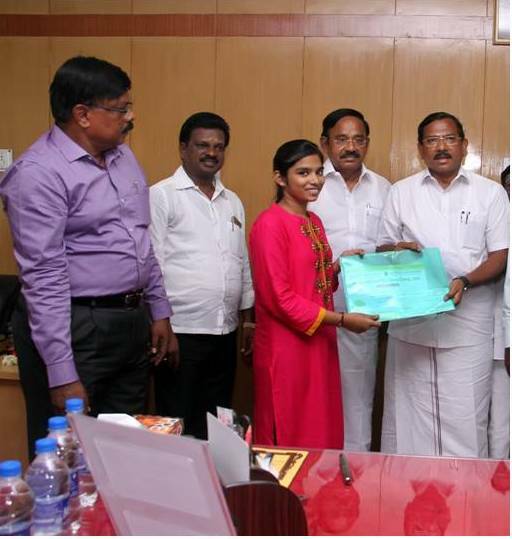 5000/- and received the same from the Minister Thiru K Pandiarajan at Tamil Nadu Art and culture Department for representing the state at the National level. VM Global inter school Foot ball tournament was held on 21.2.2018 and 22.2.2018 in which 30 teams participated in Under 13 category. 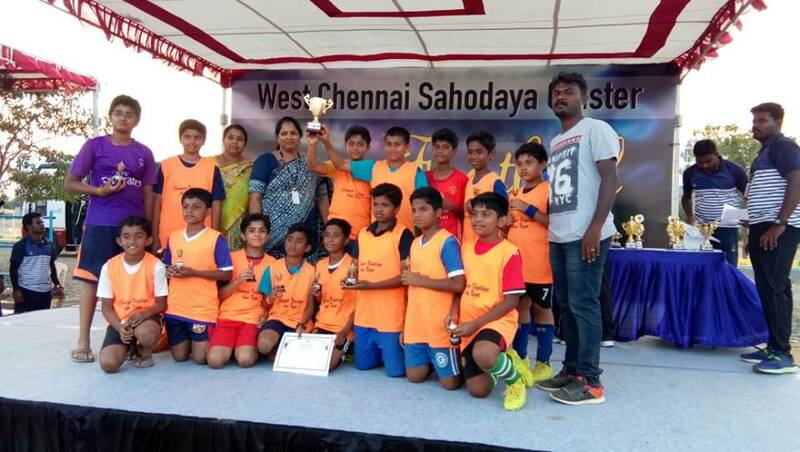 Our school boys team secured the Runner –up in the tournament. Congratulations to the participants and the PT Teachers. 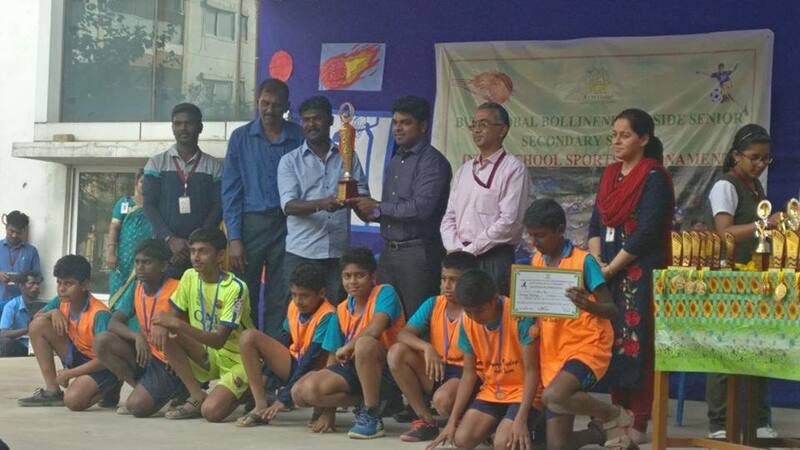 The west cluster sahodaya of Chennai has organised inter school Badminton tournament for the students of VI to VIII. 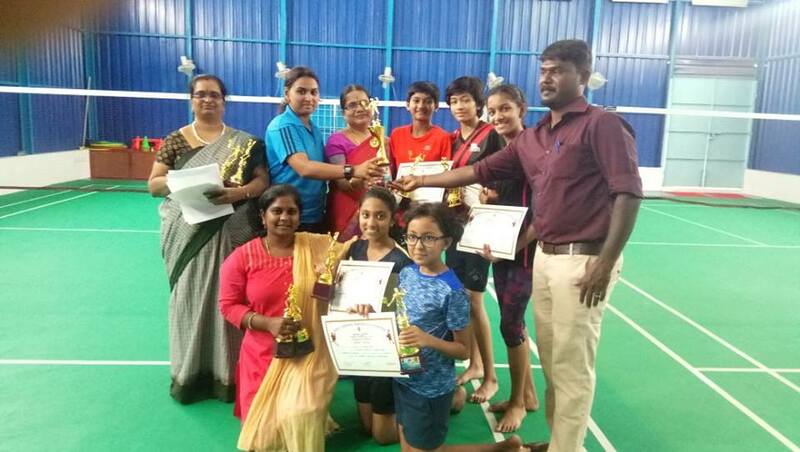 Keerthi, Saranya, Srinidhi, Anumitha rajesh, Samyuktha were the winners of the Tournament. Keerthi has won the player of the tournament. 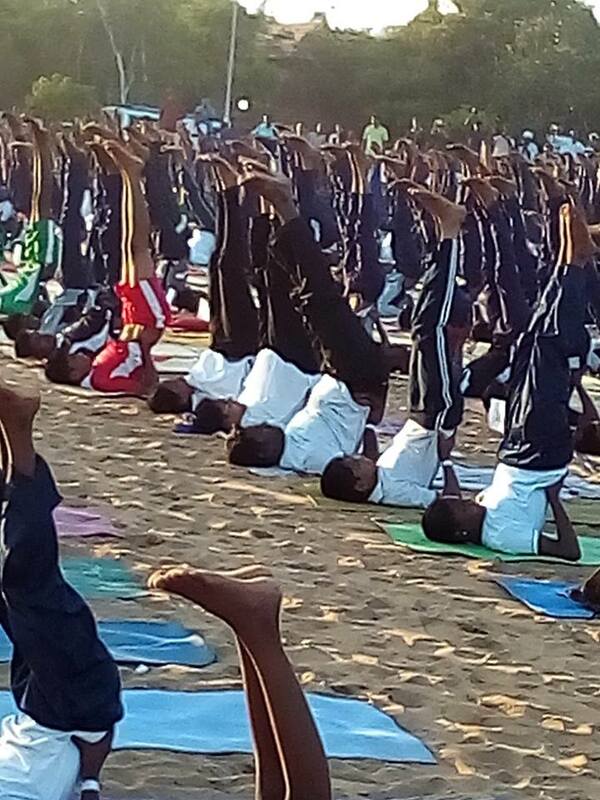 Yuvaa yoga Manthiram Trust -Guiness world record Ltd., U.K organised a programme, at Eliots Beach, Besant nagar on 2nd October 2017. 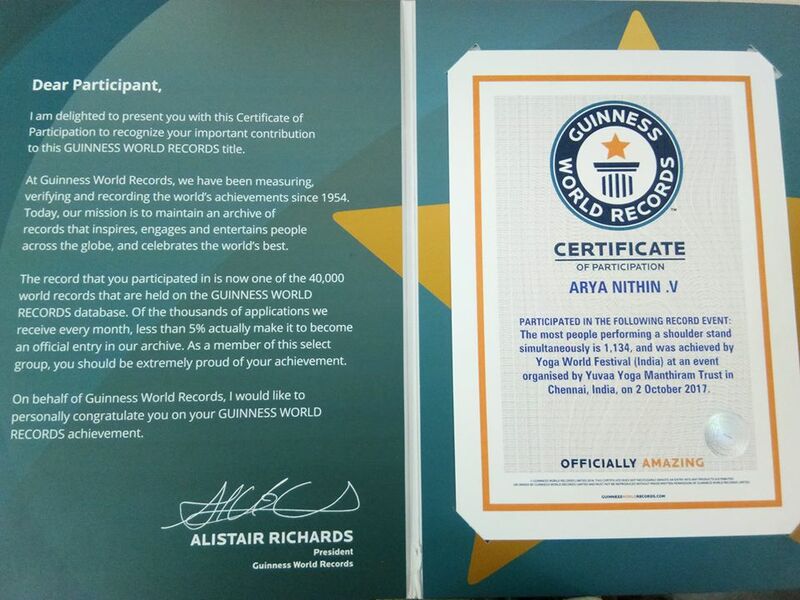 In this record , 1134 students participated, in which Aryan Nithin of Std IX – A of our vidyalaya also participated and received the certificate of Guiness record. Our heartiest congratulation to him. 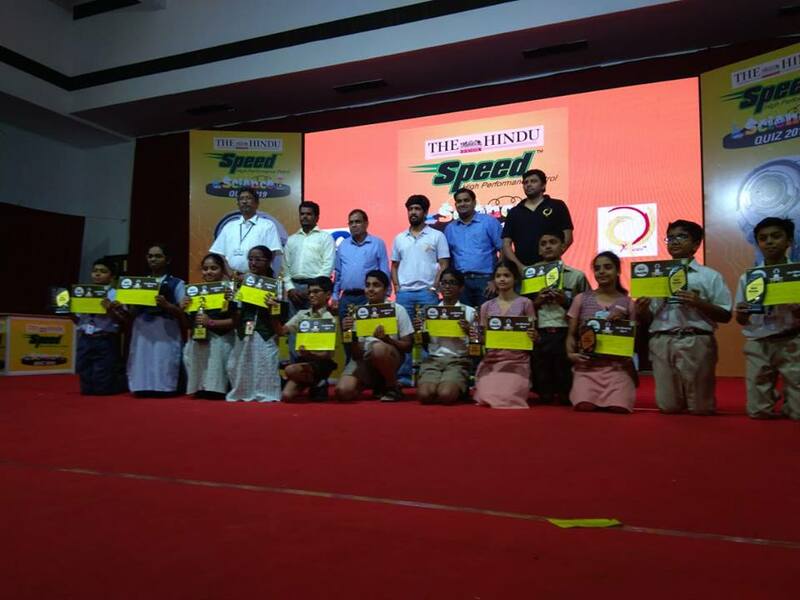 Science Quiz powered by FIITJEE - a state level quiz competition which was held on 15th April 2018 in Sir pitty Thyagaraja hall, T.nagar. Approximately 200-300 participants took part in the quiz. First round of the quiz was online, from which short listed students participated in the mega finals. The final round was a live onstage event, consisted of 6 rounds with questions based on all fields. We are happy that Master Abimanayu has emerged as a winner and won a Lenova Tab. Our Best wishes and Congratulations to him. 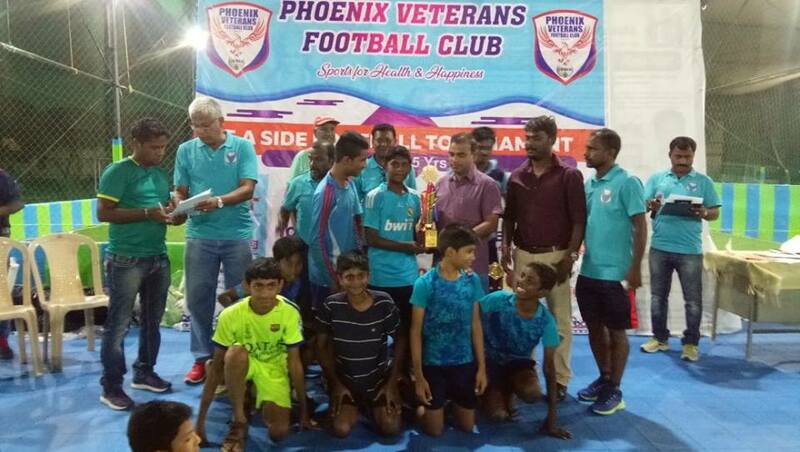 Chinmaya Football Team Under -15 participated in the tournament organised by Phoenix Veterans Football Club, on 06.05.2018. Twenty Four teams participated in this event. They played against SPFS in the Semi finals (4-3) and in the finals they won the tournament by winning the team YMFC (2-1). 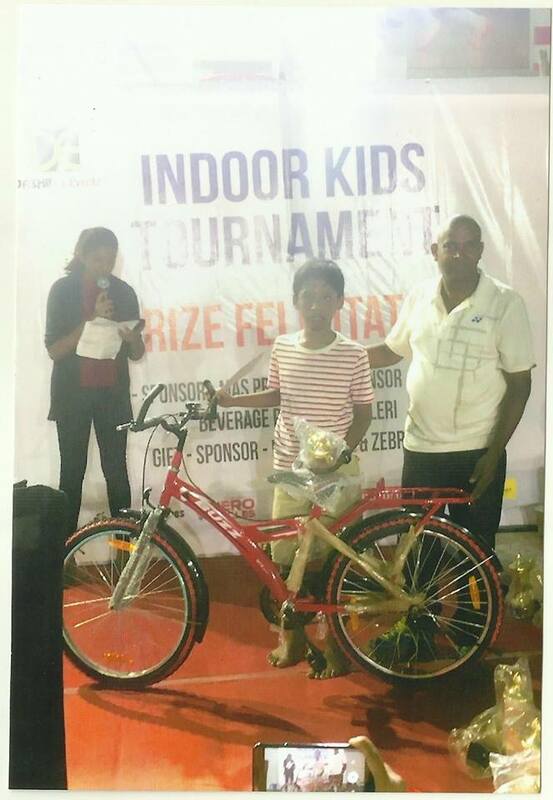 Aravind Krishna of our school won the award “Best Player of the tournament”. 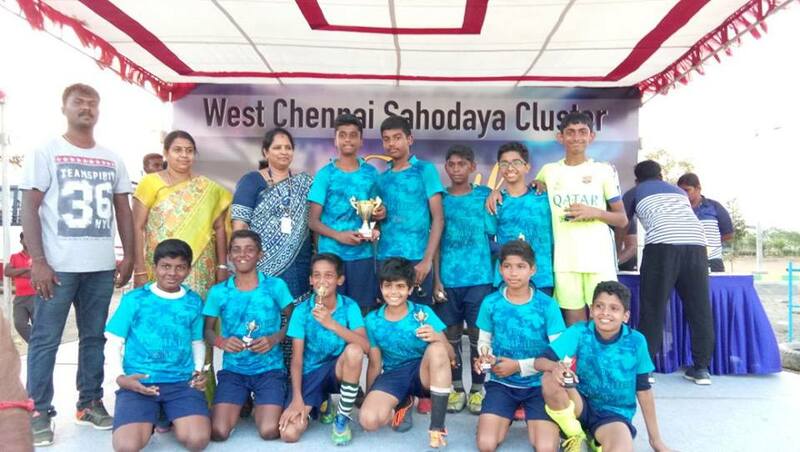 In the same tournament Under -13 category our team was the Runners-up, there were twenty two teams and they played the finals with “Mahogany”. K Sahapthan, M Vishawajith, K S Bharat Vignesh and Srividhya S from 2017 batch and Rithik Srinivas , Nirmal R S and Manu S from 2016 batch received the ‘Rajya Puraskar’ award certificate. 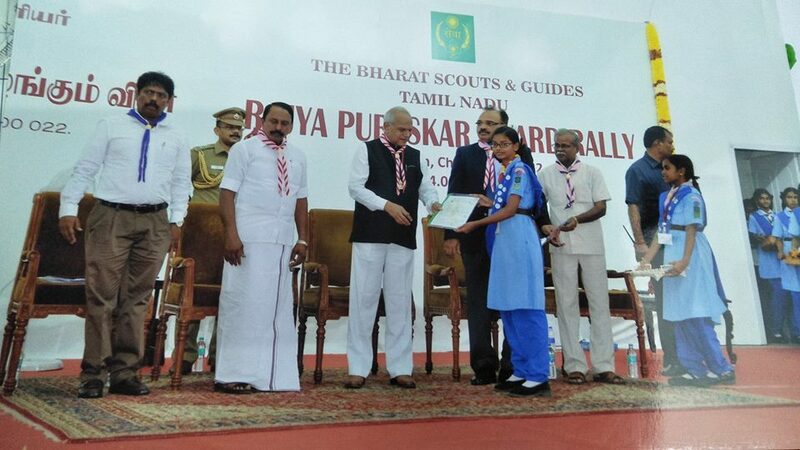 On 14 june thursday two of the students K sahapthan(scout) and Srividhya S (guide) got the privilege to receive the award from our State honourable Governor Shri. Banwarlilal Purohit along with state education minister Mr. Sengottiyan and many other important dignitaries. It was a great privilege and honour to receive the Rajya Puraskar award at Raj bhavan. 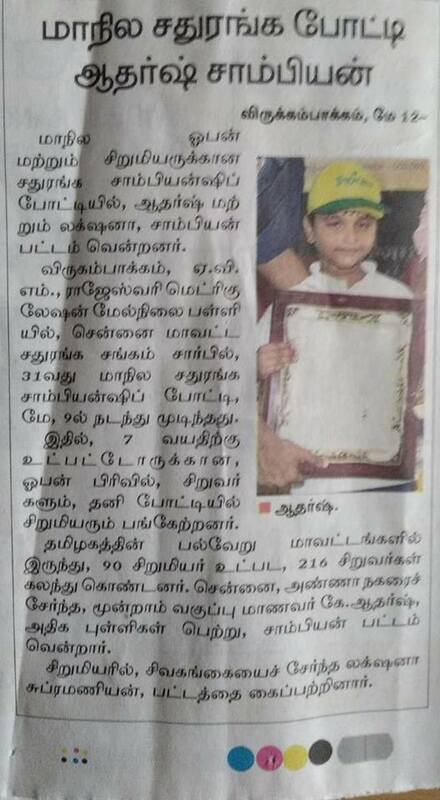 K Adharsh secured first place in U-7 category in the chess tournament conducted by Chennai District Chess Association held at Avichi school, Virugambakkam on 3rd-4th February. 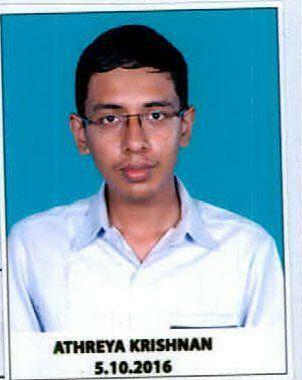 Hence forth he will represent Chennai district in upcoming chess tournament held within the state. Rithanya R of std VI participated in field archery at the 63rd National school games in Madhya Pradesh between 14 and 18 January. 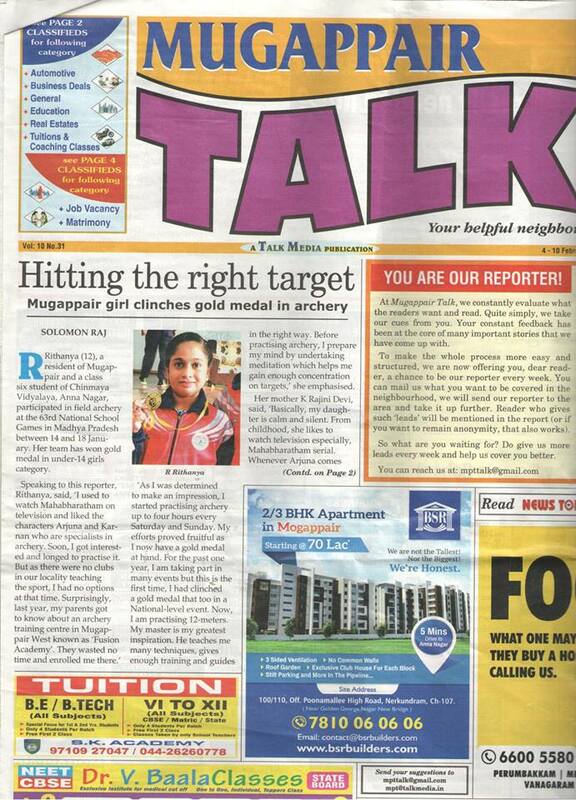 Her team has won gold medal in Under-14 girls category. Congratulations to her. S Nitin ganesh of VIII A has participated in 32nd National ITF Taekwondo championship 2017, held at SMS stadium, Jaipur , Rajasthan from 28th December to 30th December 2017. 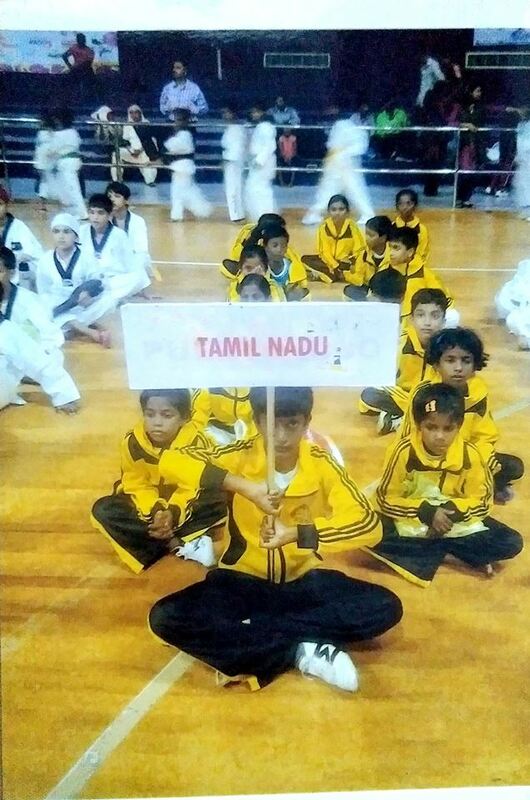 Participants from 27 states participated in this event, which was organised by Taekwonda Association of India, headed by Mast. Rajendran Balan, 8th DAN Black Belt and Mast. 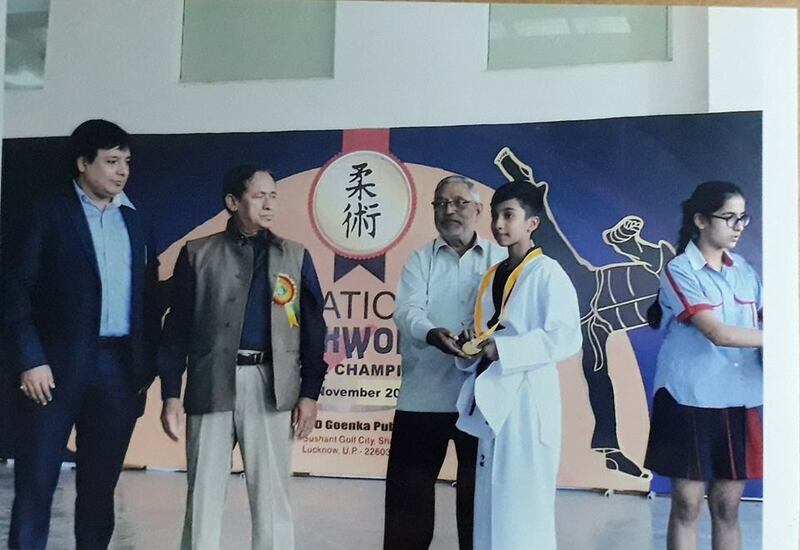 Rachana Chourasia, 7th DAN Black Belt. 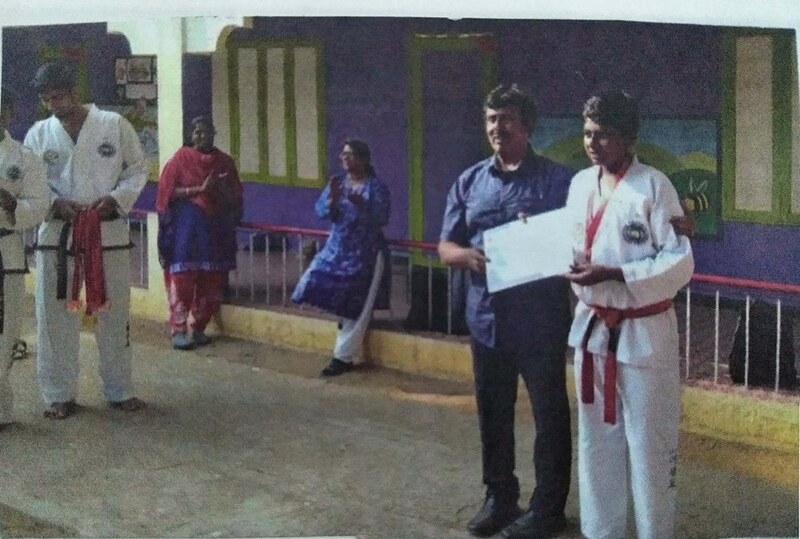 Among the 27 students he was adjudged to win Bronze medal in individual sparing with the opponent teams from Delhi, Karnataka and Haryana. Mukund Dev. J. 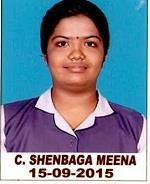 S, of Std VII B is a budding sports person of CVA. 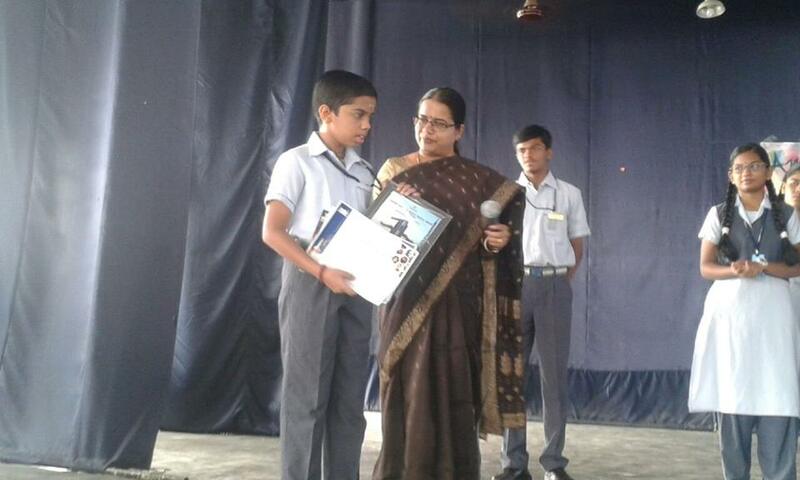 He participated in school level track events in the primary class level and won many prizes. He is also a Karate Black belt holder. At present Mukund is focusing on Badminton tournament. 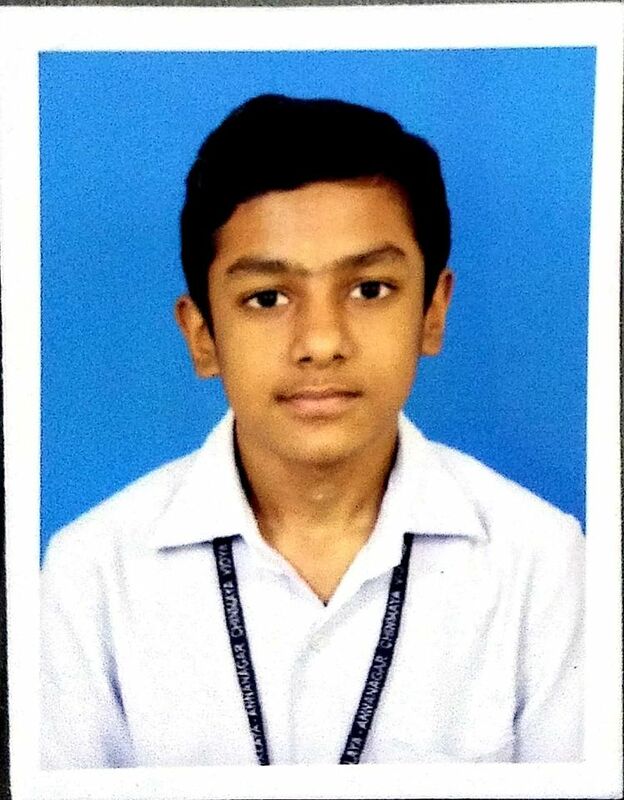 He was selected as state level quarter finalist in the year 2017. 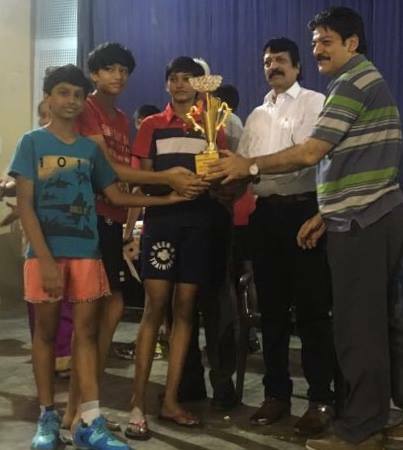 He is participating in All India Tournament with professional training and recently got an opportunity to meet and interact with P V Sindhu International player, after he won in the sports quiz organised by the Boost Company. His dream is to represent India in the Olympics. Our best wishes and congratulations to Mukund Dev. 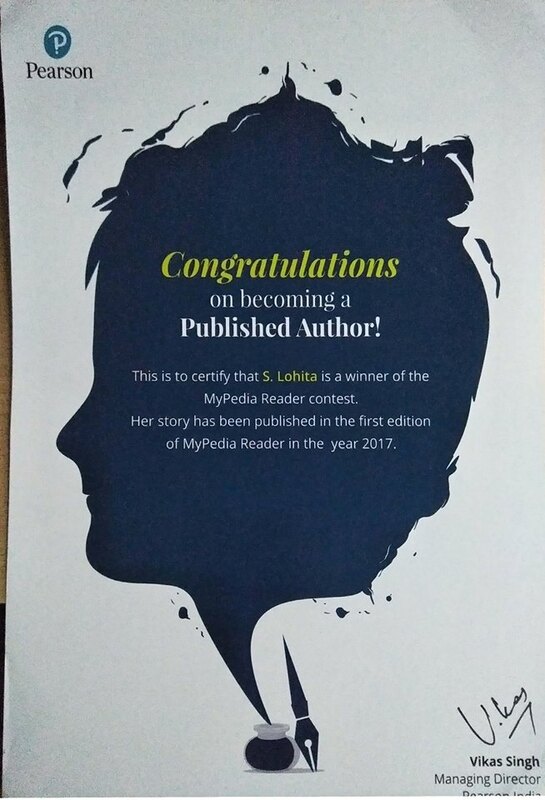 S Lohita of class XI is a winner of the my pedia reader contest. 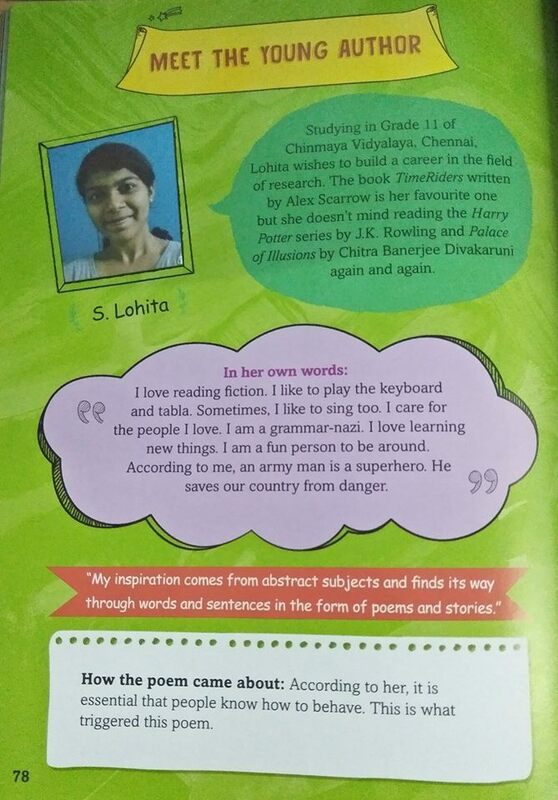 Her poem has been published in the first edition of my pedia reader in the year 2017. Congratulations and best wishes to her. 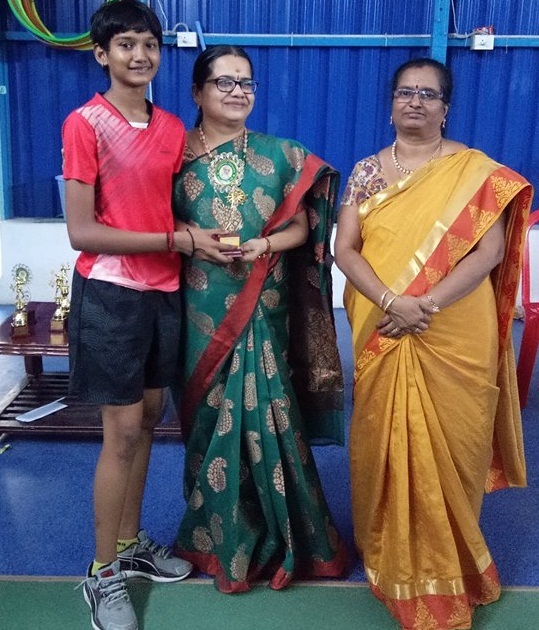 Lochanashree of VIII C played in the Presidency club open Annual Tennis Tournament in the doubles open category with Arivazhagan a student of other school as her partner and won the Runner up. In this event about 35 members took part which was conducted by presidency club of Chennai. 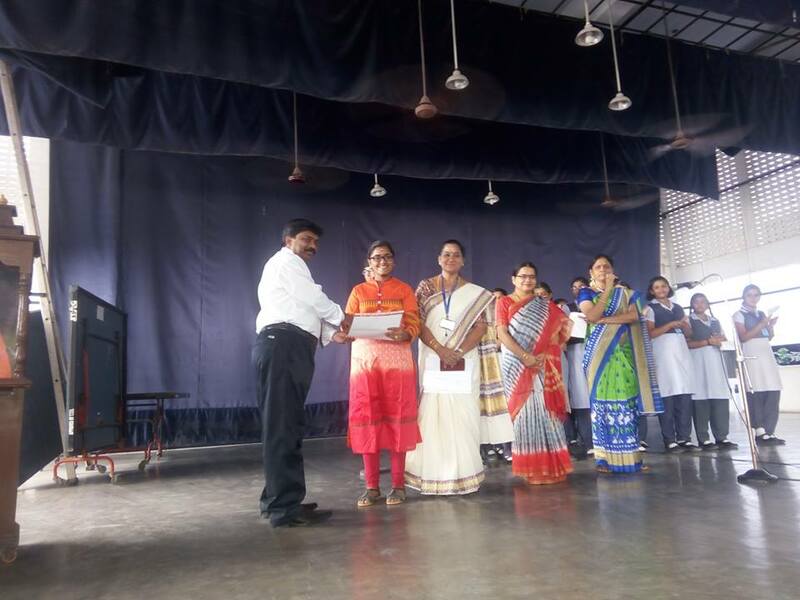 Prize distribution was held on 24.12.2017. 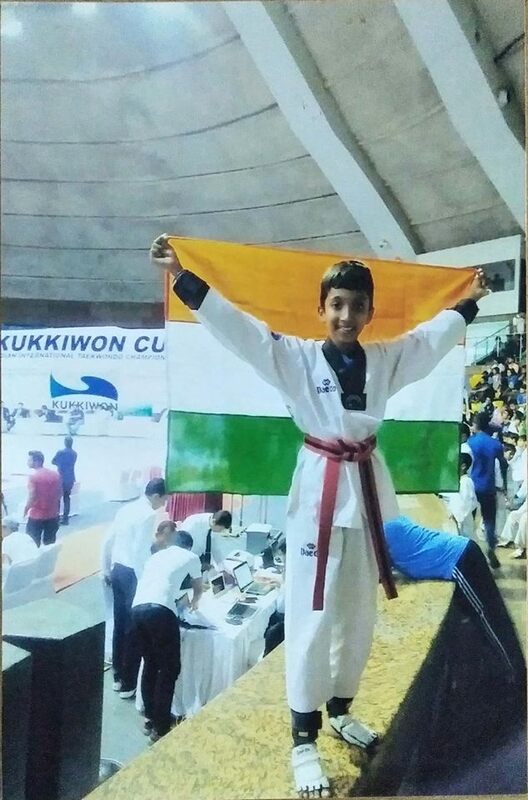 Congratulations to Thvarita Rao of class VII C who has won Bronze medal in National level Taekwondo federation of India (TFI). Her achievements during the year 2017-18. Sahodaya School complex on 11.9.2017 at Chennai Public School, Annanagar. 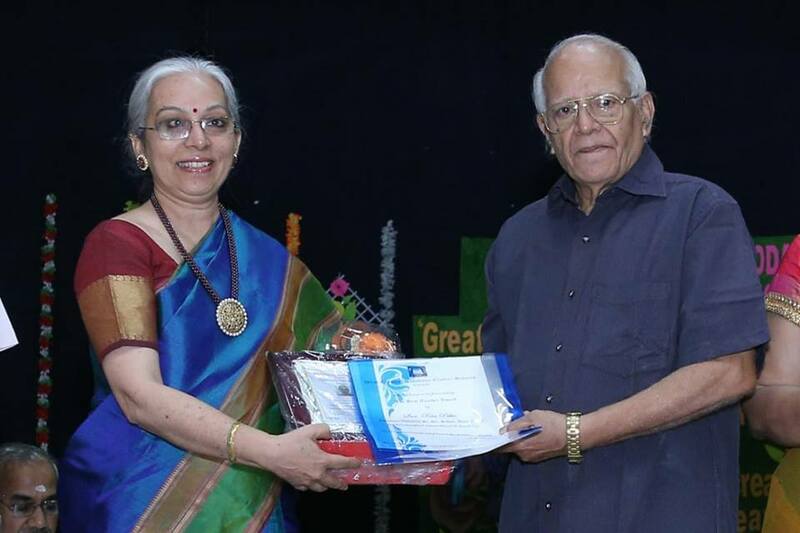 Congratulations to Mrs. Chitra Ashok. 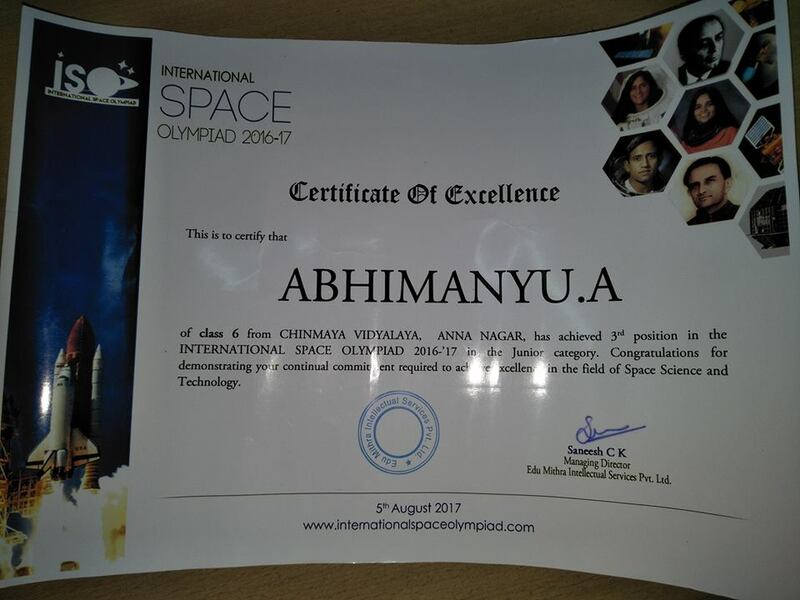 A. Abhimanyu of Std VII has participated in the International Space Olympiad, organised and conducted by Edu Mithra Intellectual Educational service Pvt. Ltd. Round I Quiz was held on February 26, 2017. Round II Intermediate level was held on May 20, 2017 and final level was held on August 5th, 2017. 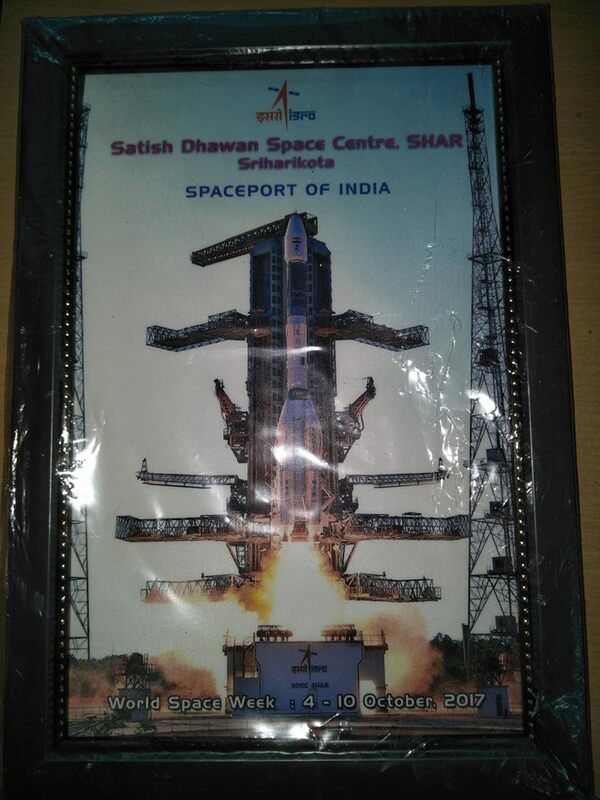 Under the following topics Space science and technology 1. Astrophysics 2. General science 3. Space history 4. Advanced physics 5. Astronauts, space manned missions and satellites. He got III prize, also got a special prize to visit NASA. It is a proud achievement for him and to the school. 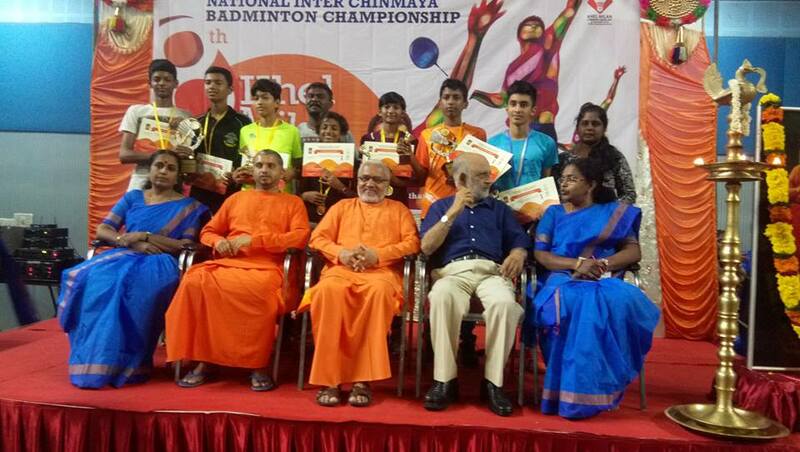 Shasvat vijay of Std IX has participated in state sub Junior Ranking Badminton Tournament held in Sivakasi during 28th October to 5th November. 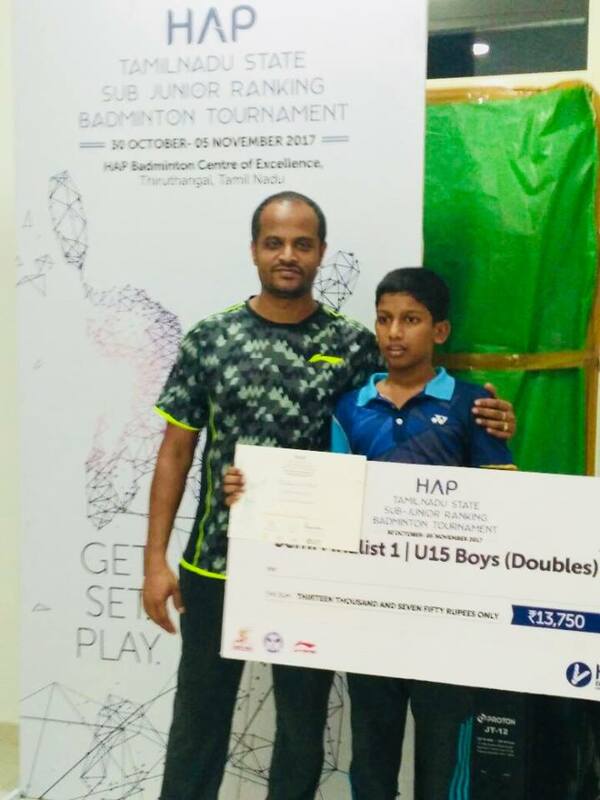 More than 200 players from all over TamilNadu took part in this tournament and he was placed 3rd in the U-15 Boys doubles event. He was awarded a cash prize of Rs. 13750/- and a trophy. Congratulations and best wishes for his future endeavours. 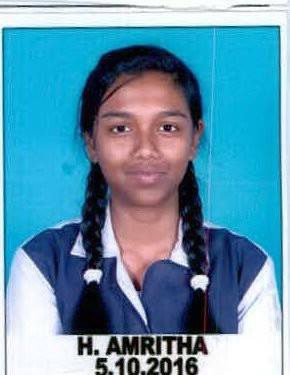 We are happy to inform you that Shenbaga Meena of Class XII B (commerce) has secured (492/500) in class XII Board Exam 2016-17 and also scored a centum in Economics. 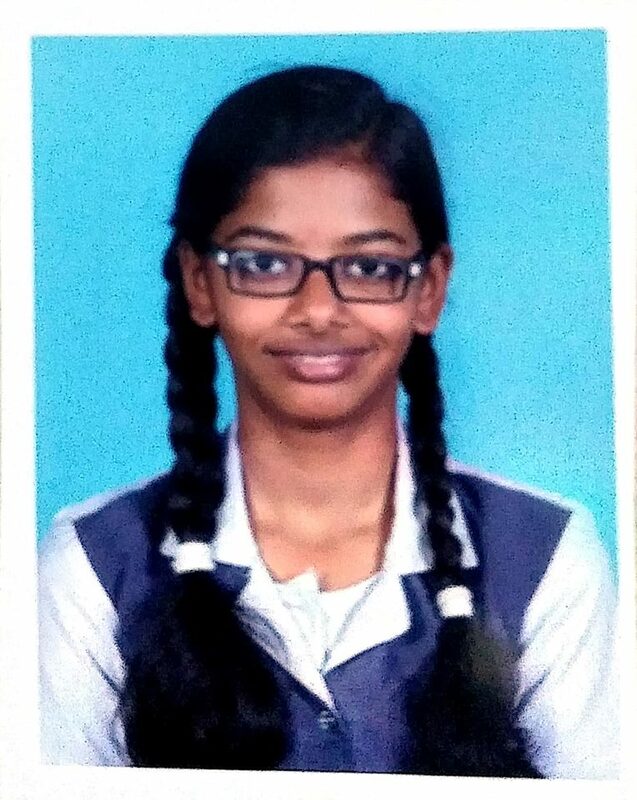 This has placed her as one of the city toppers of Chennai.Our Congratulation to the School toppers & Subject toppers of Std XII – Board Exams 2016-2017 and for the students those who have secured 10 CGPA in X Board Exams.